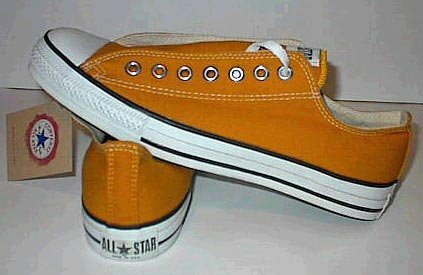 Photo gallery of different models of high top and low cut orange chucks. 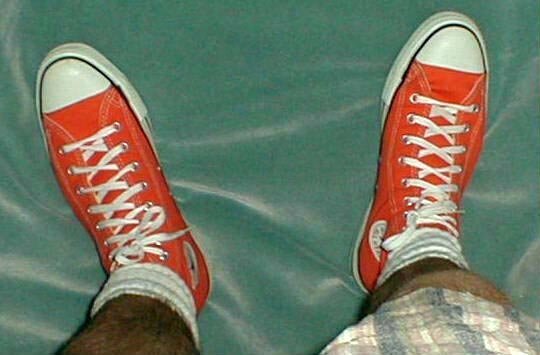 1 Orange Chucks Inside patch view of a right bright orange high top chuck. 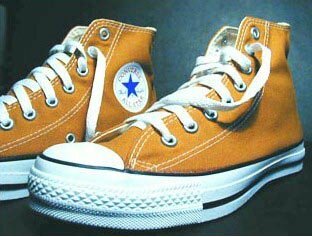 2 Orange Chucks Outside view of a right bright orange high top chuck. 3 Orange Chucks Inside patch view of a left bright orange high top chuck. 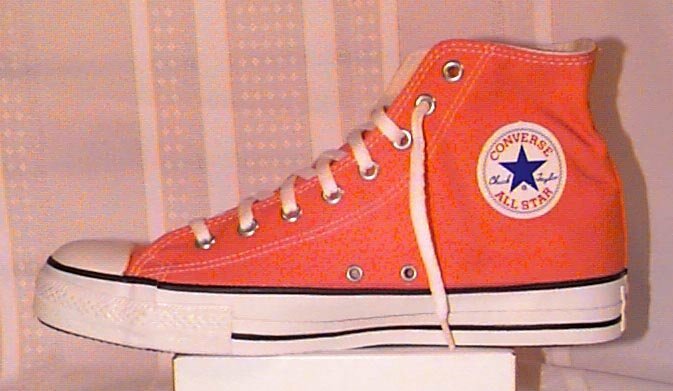 4 Orange Chucks Outside view of a left bright orange high top chuck. 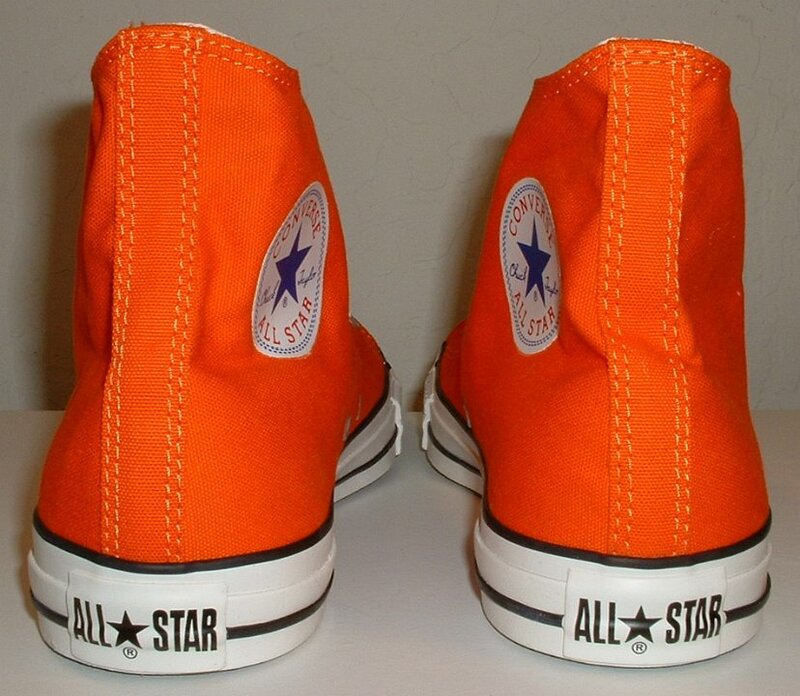 5 Orange Chucks Rear view of bright orange high top chucks. 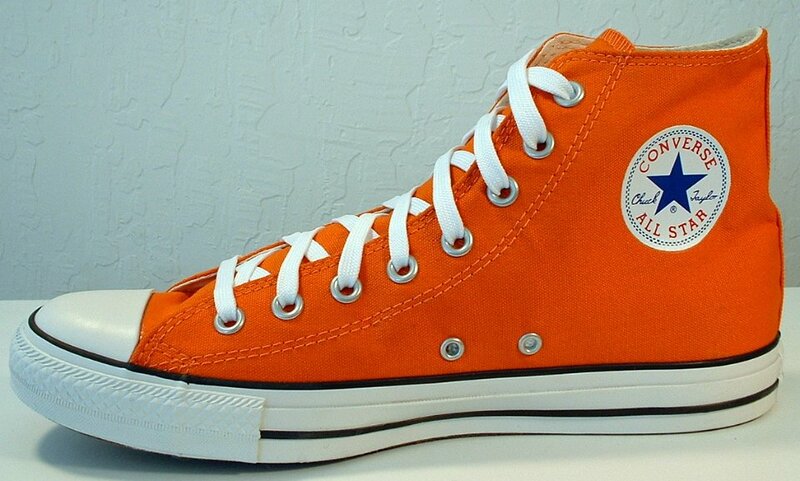 6 Orange Chucks Angled rear view of bright orange high top chucks. 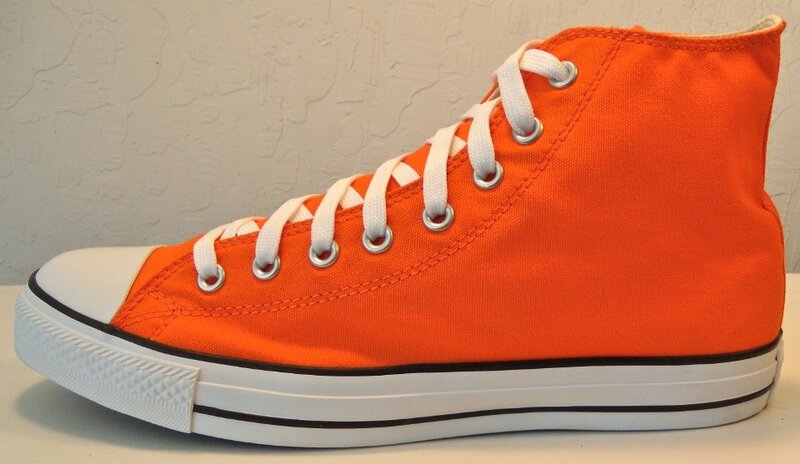 7 Orange Chucks Angled side view of bright orange high top chucks. 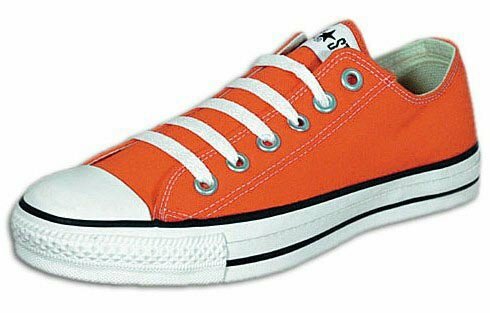 8 Orange Chucks Front view of bright orange high top chucks. 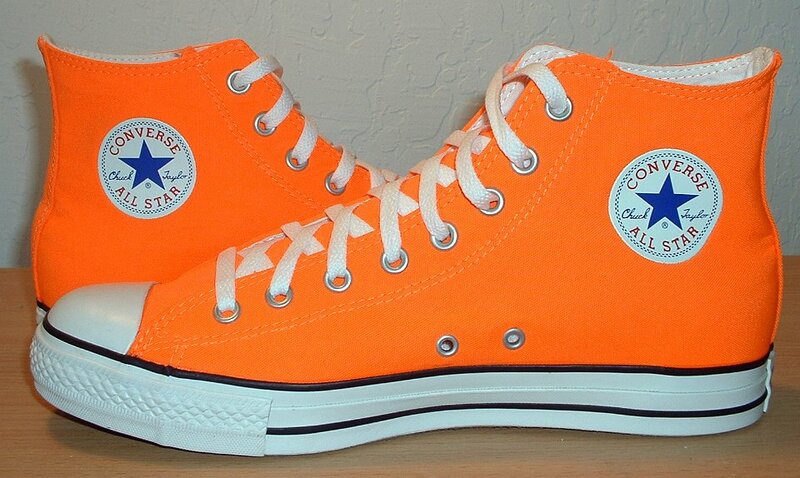 9 Orange Chucks Inside patch views of bright orange high top chucks. 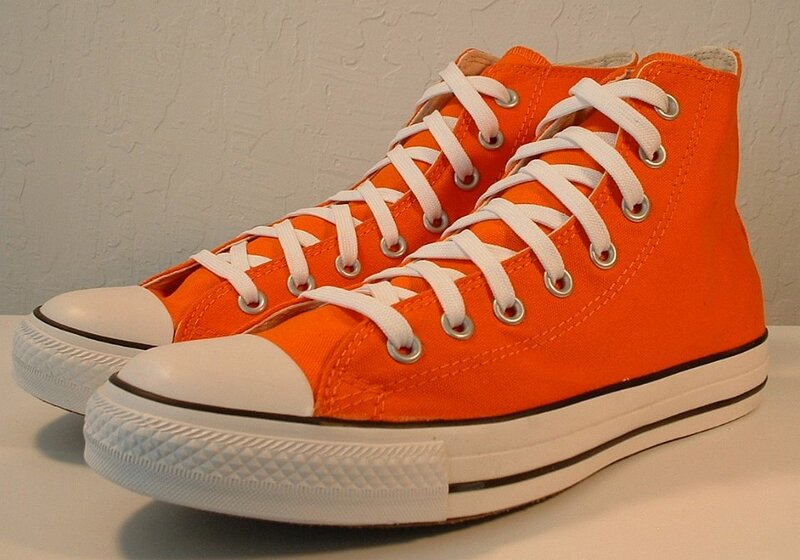 10 Orange Chucks Top view of bright orange high top chucks. 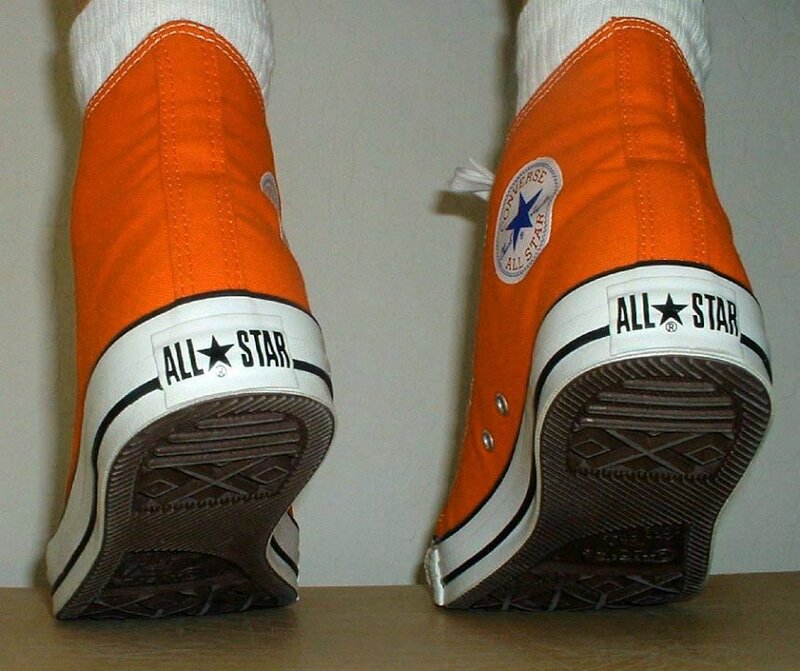 11 Orange Chucks Insole view of bright orange high top chucks. 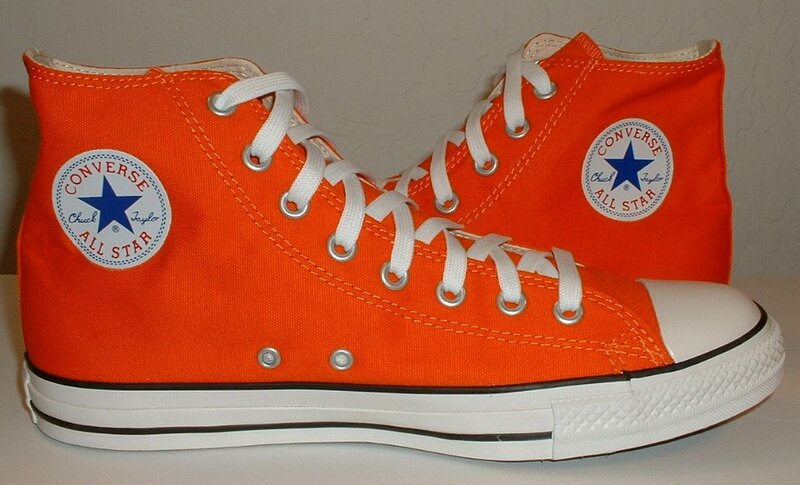 12 Orange Chucks Inside patch views of bright orange high top chucks. 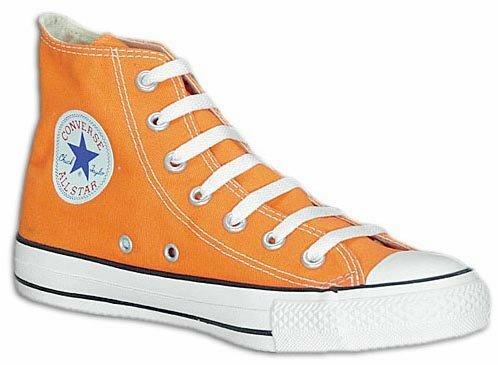 13 Orange Chucks Outside views of bright orange high top chucks. 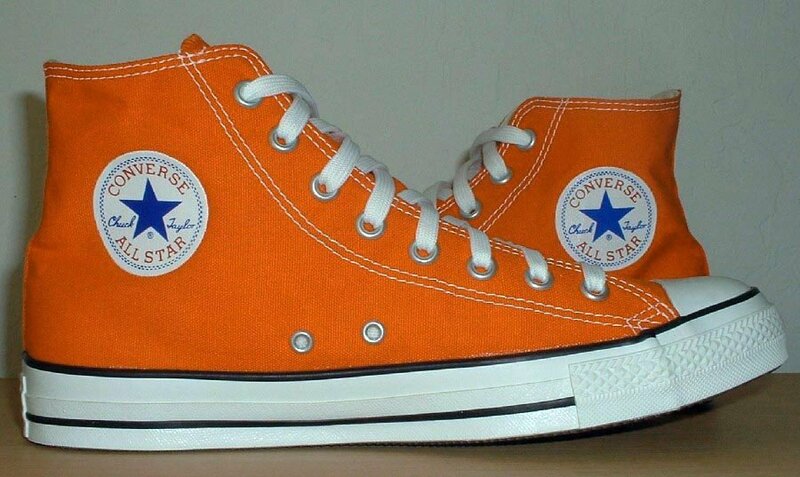 14 Orange Chucks Inside patch and sole views of bright orange high top chucks. 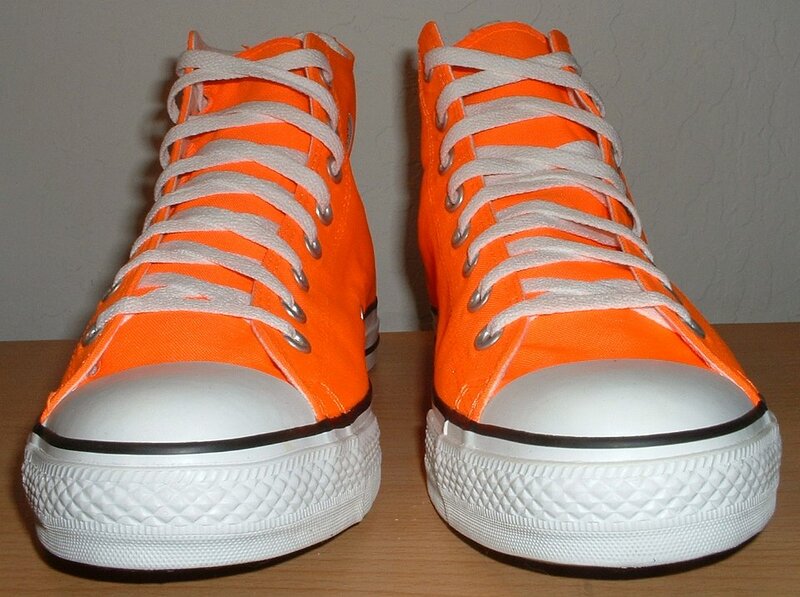 15 Orange Chucks Bright orange high tops side view. 16 Orange Chucks Flame orange left high top, inside view. 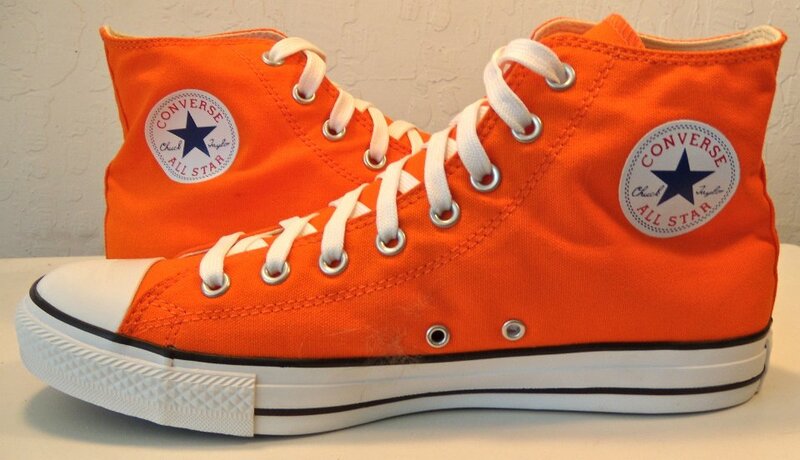 17 Orange Chucks Right orange flame high top, inside view. 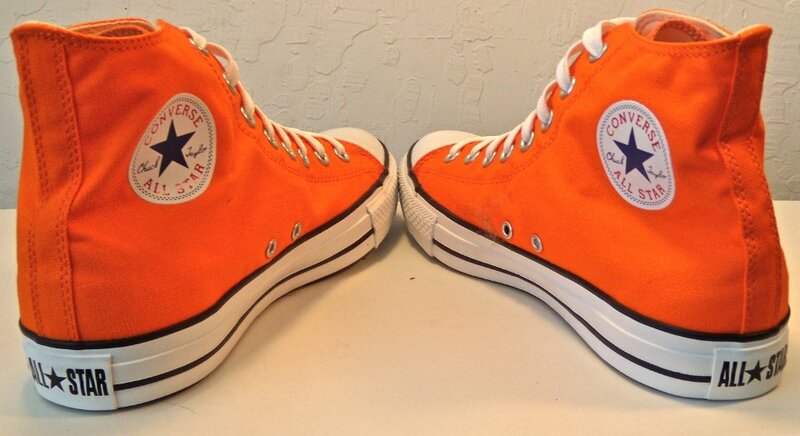 18 Orange Chucks Flame orange high tops, sole and inside right views. 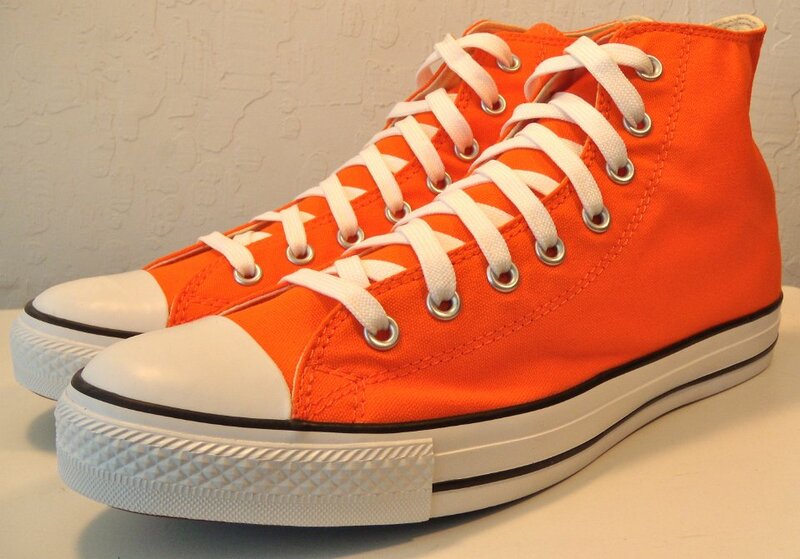 19 Orange Chucks Orange flame high tops, angled front view. 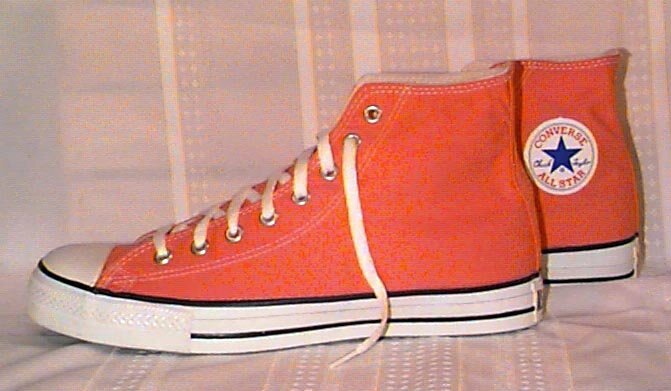 20 Orange Chucks Flame orange high tops, side view. 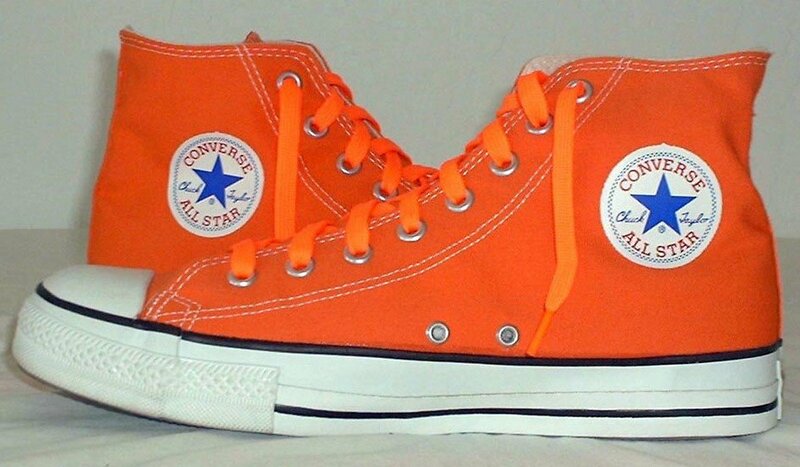 21 Orange Chucks Flame orange high tops, front view. 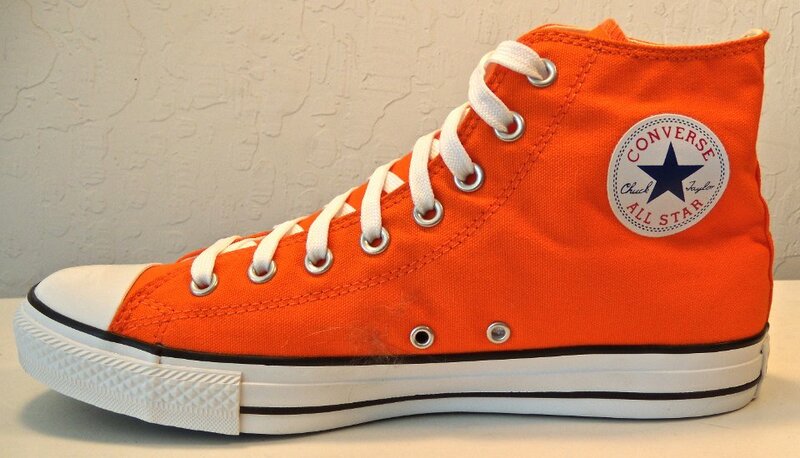 22 Orange Chucks Orange flame high tops with orange laces, right inside and sole views. 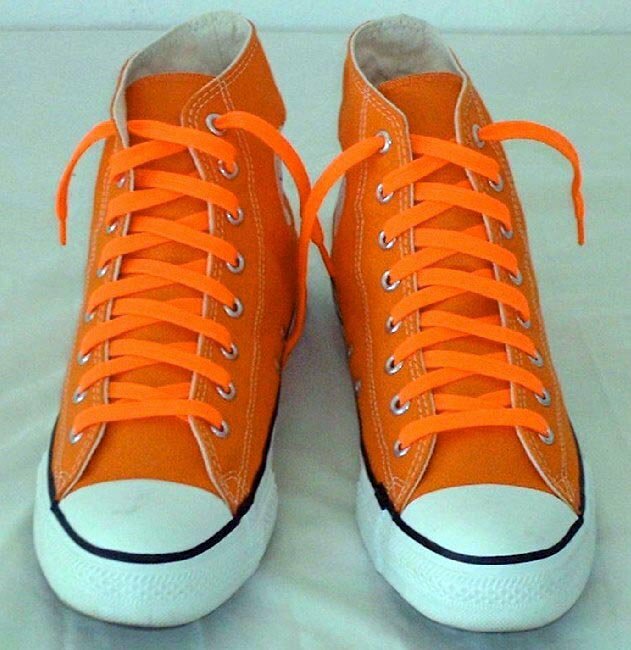 23 Orange Chucks Flame orange high tops with orange laces, patch views. 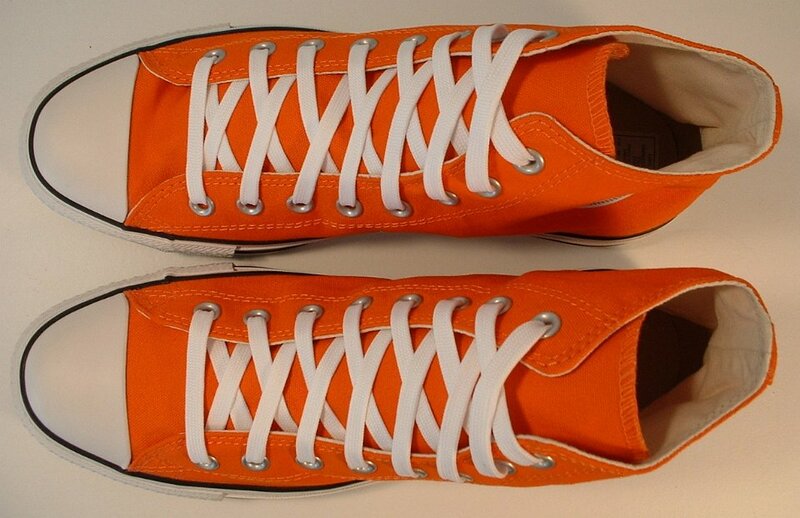 24 Orange Chucks Orange flame high tops with orange laces, angled front view. 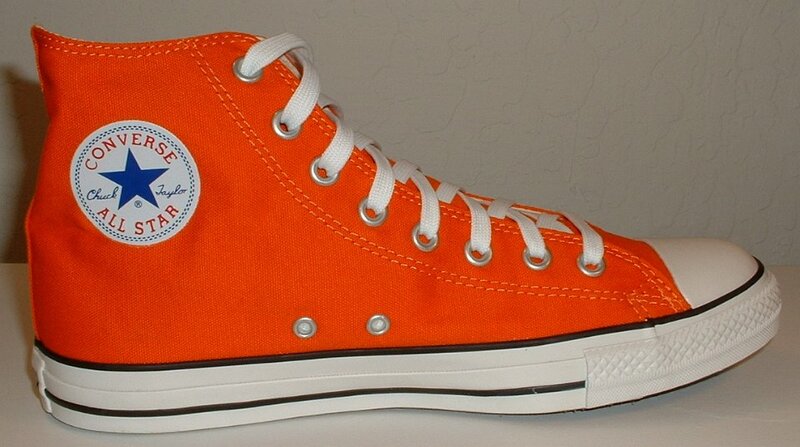 25 Orange Chucks Orange flame high tops with orange laces, inside patch view. 26 Orange Chucks John Schneider autographing an orange General Lee high top. 27 Orange Chucks Ken Turner and John Schneider with a General Lee high top. 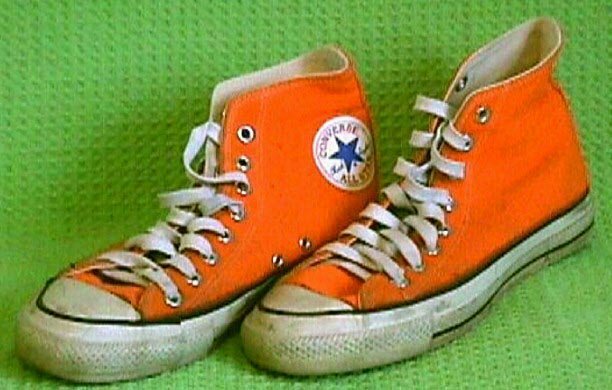 28 Orange Chucks General Lee Dukes of Hazzard orange high top chucks. 29 Orange Chucks General Lee chucks on a shelf. 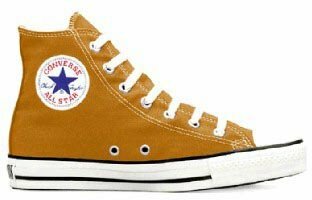 30 Orange Chucks Brand new gold high tops, inside patch views. 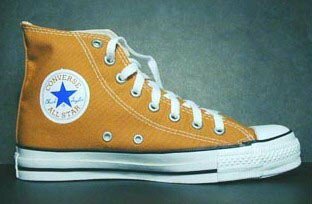 31 Orange Chucks Brand new gold low cuts, side and rear views. 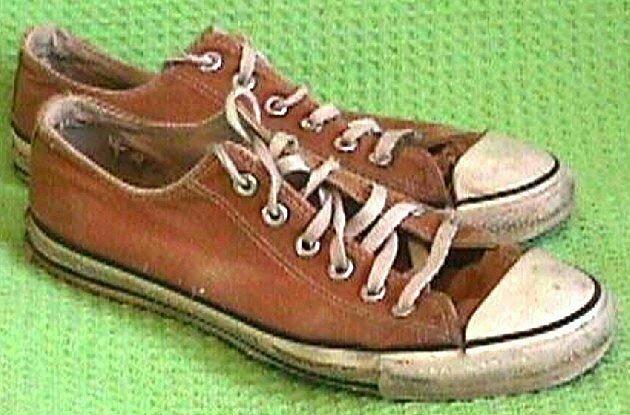 32 Orange Chucks Henry Winkler 'Fonz" high top chuck. 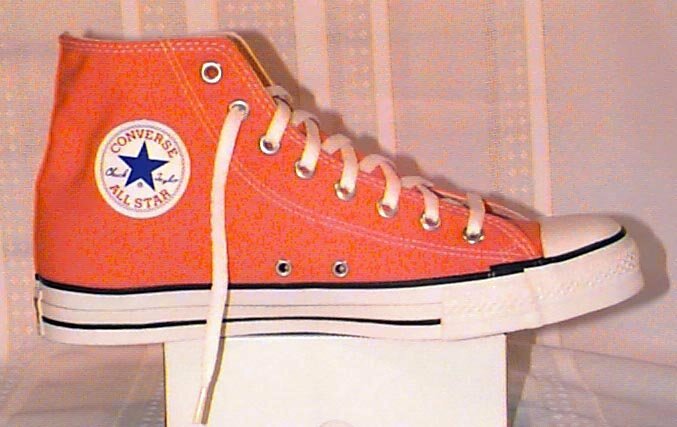 33 Orange Chucks Left bright orange high top, inside view, from a catalogue photo. 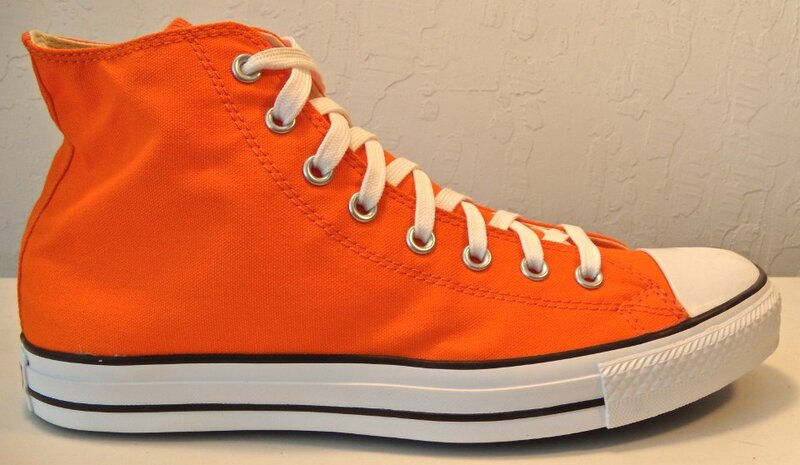 34 Orange Chucks Brand new bright orange high tops. 35 Orange Chucks Closeup of the patch on an orange high top. 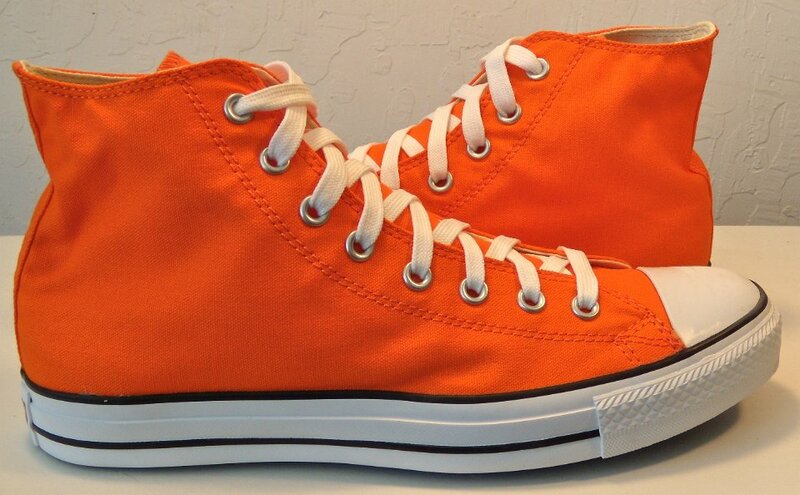 36 Orange Chucks New orange high tops, outside and top views. 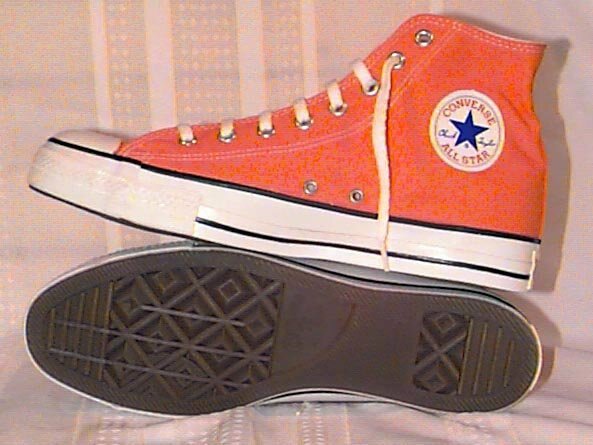 37 Orange Chucks Bright orange low cut, side and sole views. 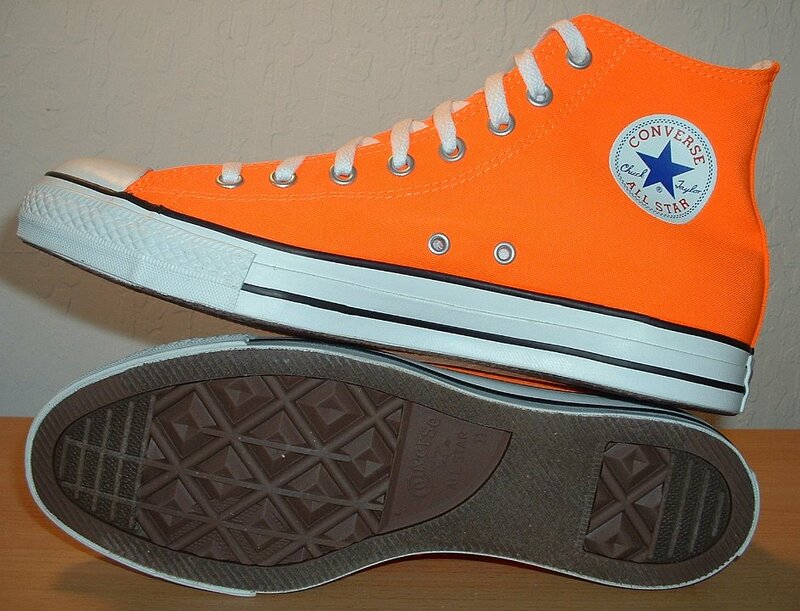 38 Orange Chucks New neon orange high top, left inside patch view. 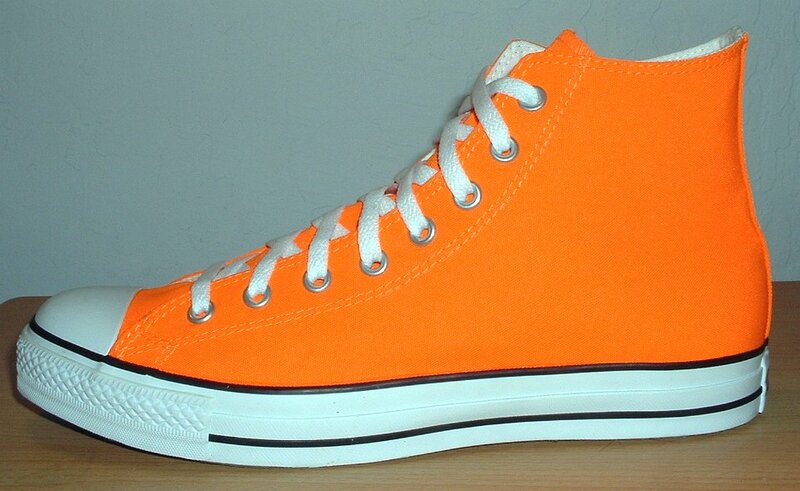 39 Orange Chucks New neon orange high top, left outside view. 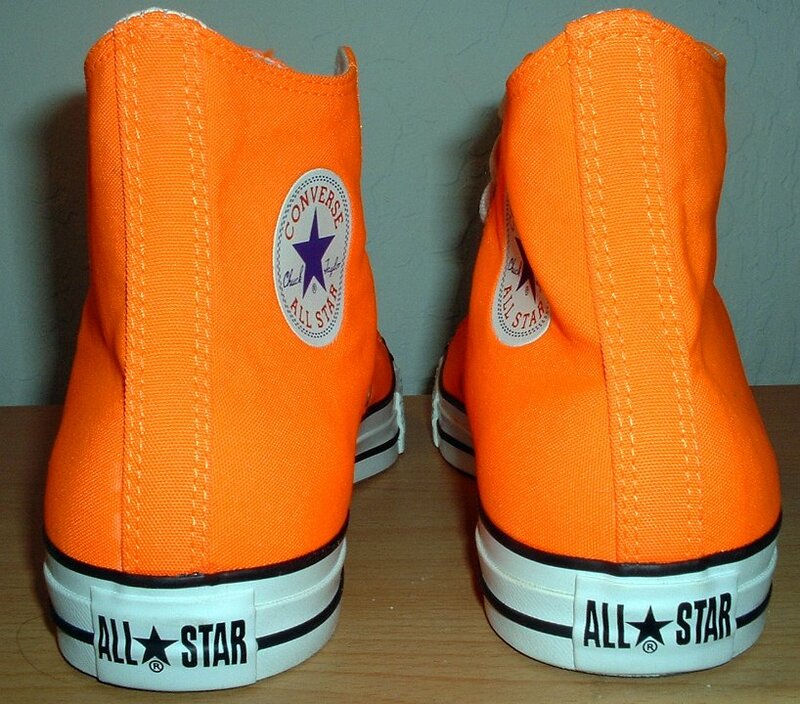 40 Orange Chucks New neon orange high top, right inside view. 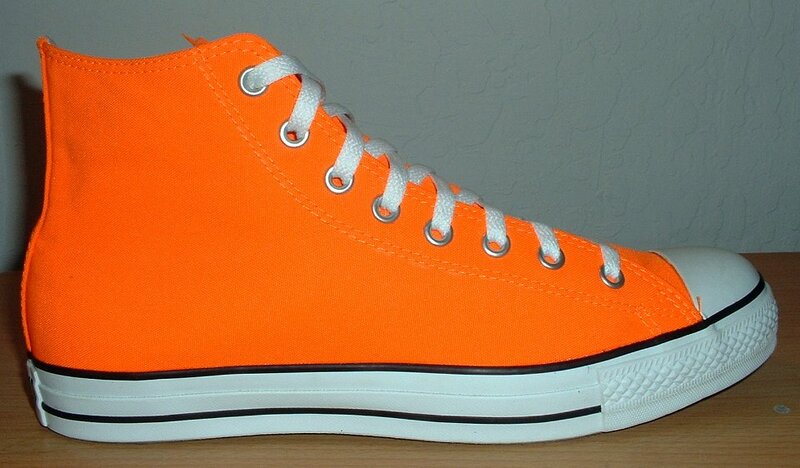 41 Orange Chucks New neon orange high top, right outside view. 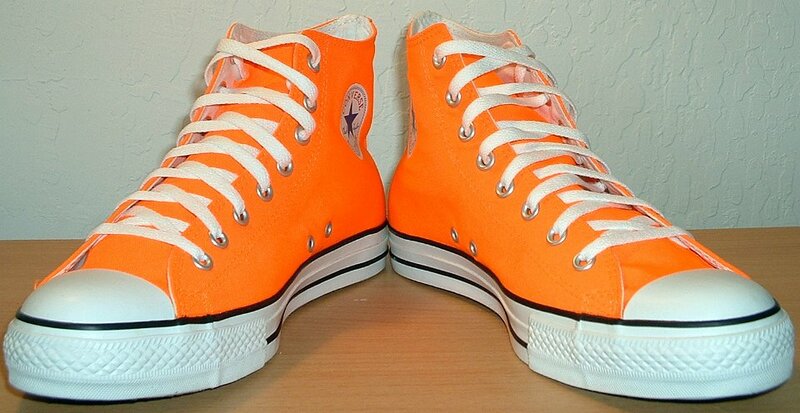 42 Orange Chucks New neon orange high tops, rear view. 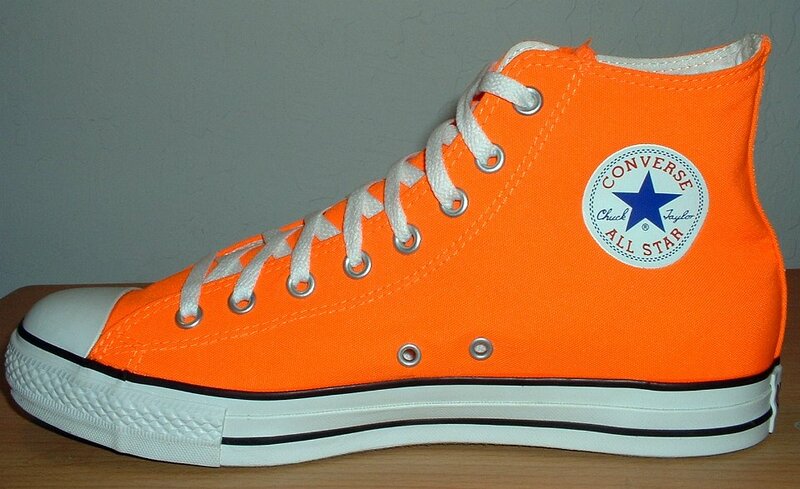 43 Orange Chucks New neon orange high tops, front view. 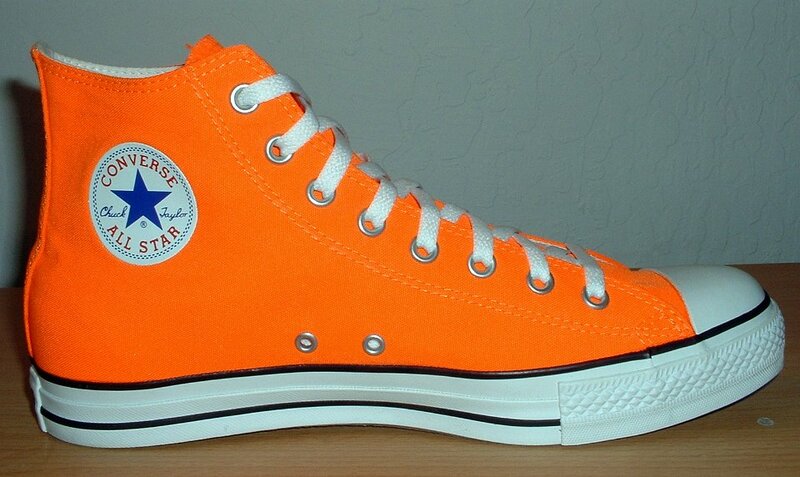 44 Orange Chucks New neon orange high tops, top view. 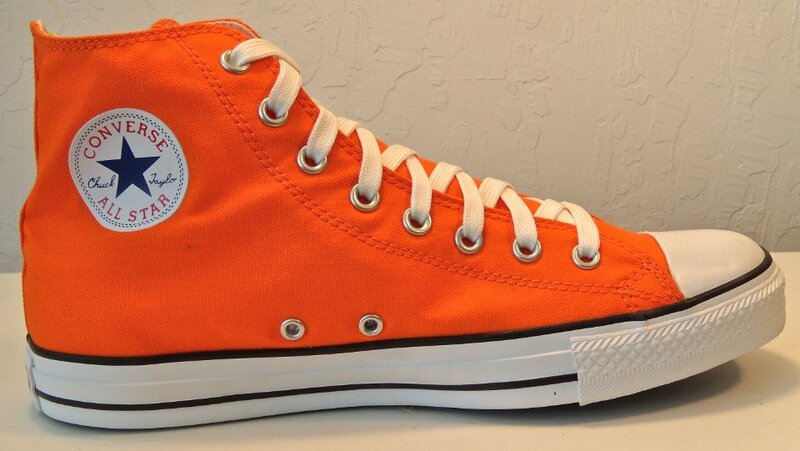 45 Orange Chucks New neon orange high tops, inside patch and sole views. 46 Orange Chucks New neon orange high tops, inside patch view. 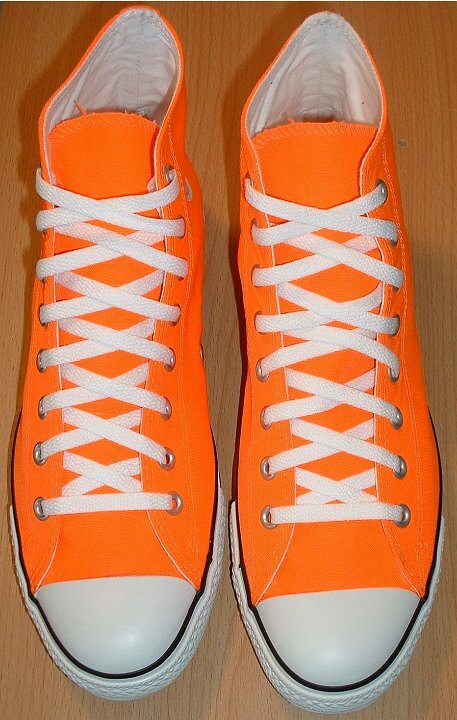 47 Orange Chucks New neon orange high tops, angled front view. 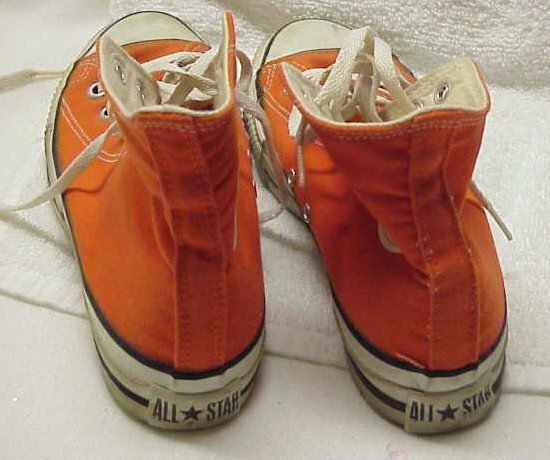 48 Orange Chucks Worn orange high tops, angled side view. 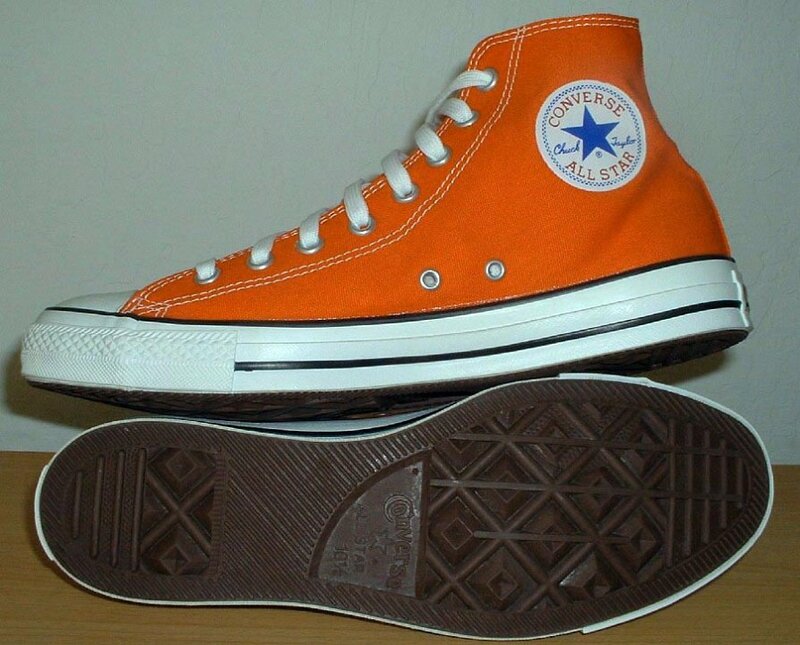 49 Orange Chucks Left orange high top, inside view. 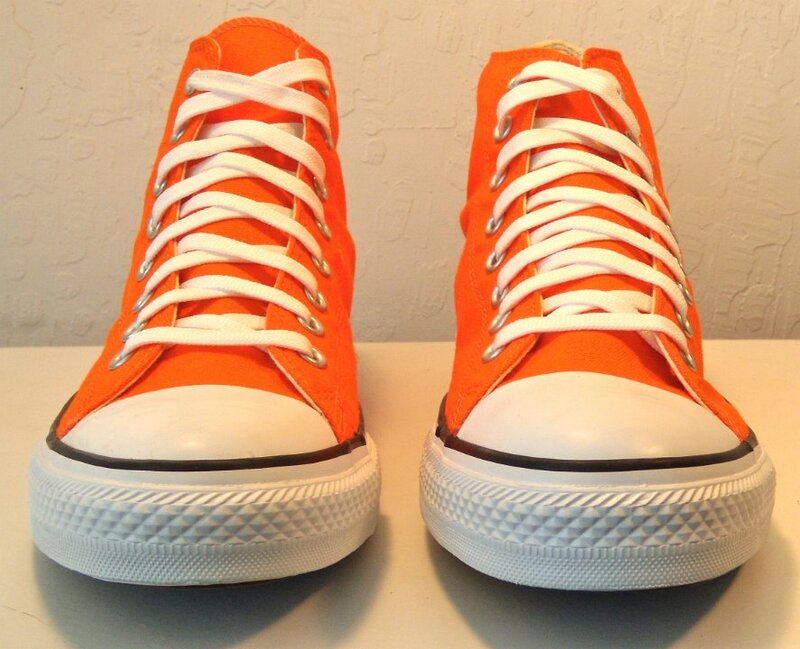 50 Orange Chucks Orange high tops, inside patch and rear views. 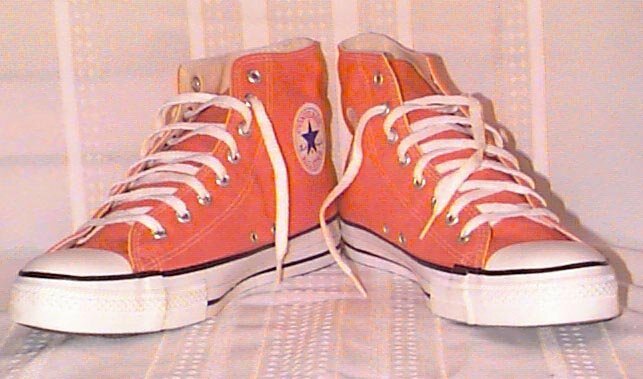 51 Orange Chucks Vintage orange high tops, top and side views. 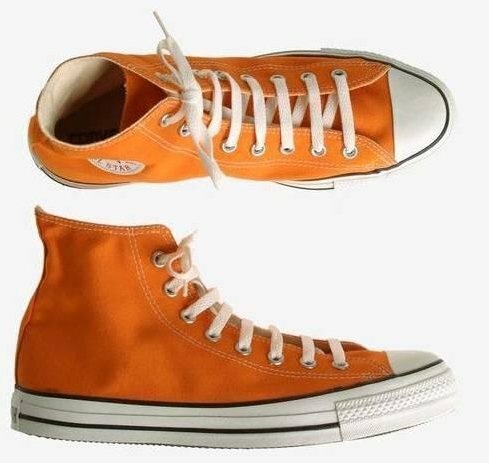 52 Orange Chucks Vintage orange high tops, front and rear views. 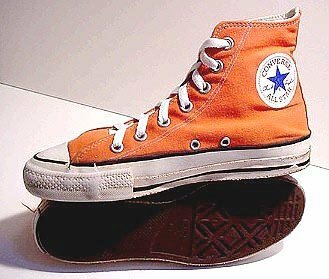 53 Orange Chucks Vintage orange high tops, right inside and sole views. 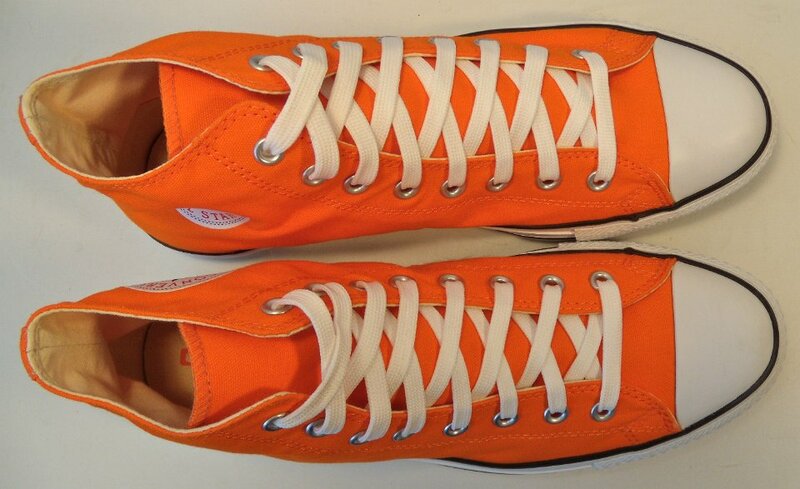 54 Orange Chucks Orange high tops with orange laces, front and top view. 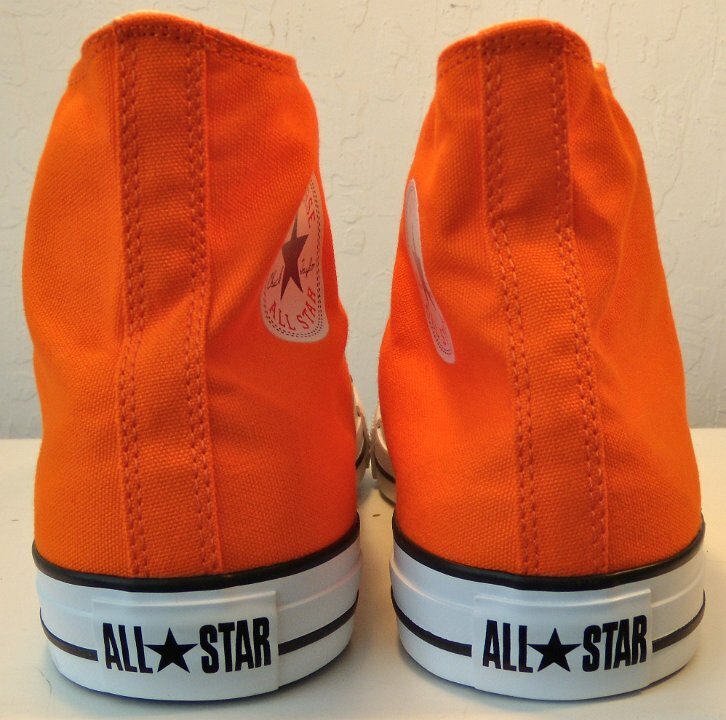 55 Orange Chucks Left orange high top, inside patch view. 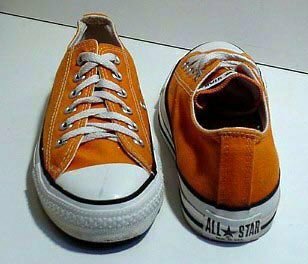 56 Orange Chucks Left orange high top, outside view. 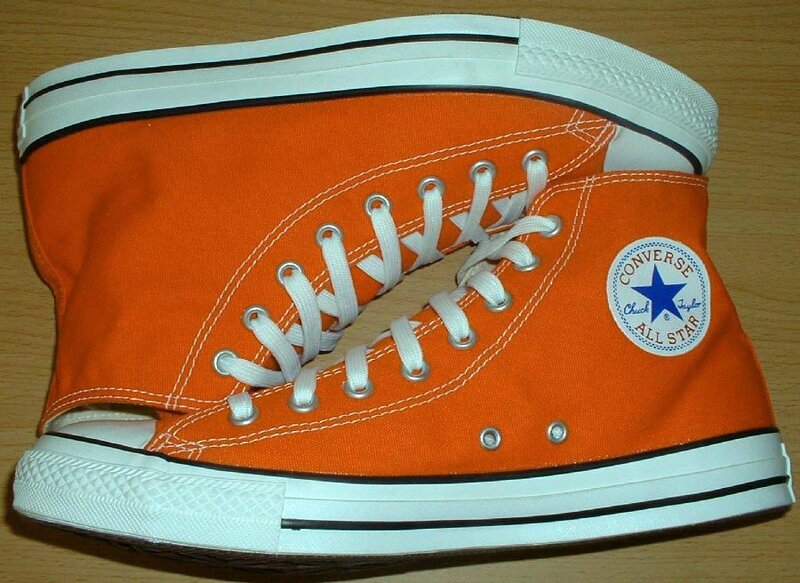 57 Orange Chucks Right orange high top, inside patch view. 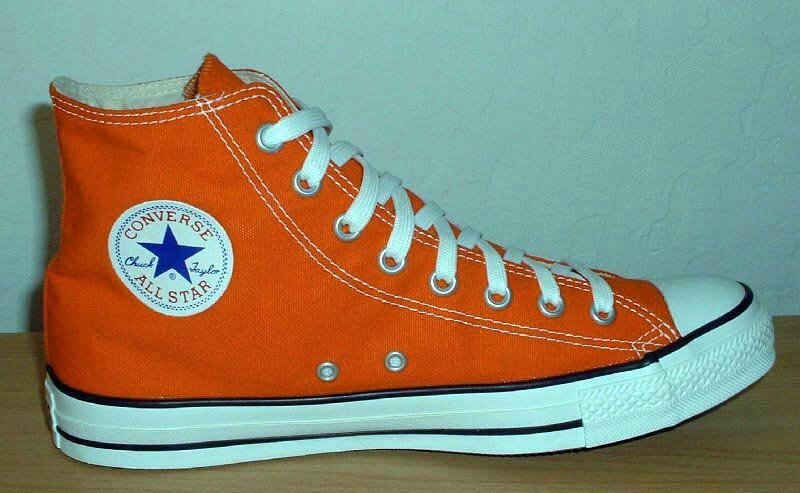 58 Orange Chucks Right orange high top, outside view. 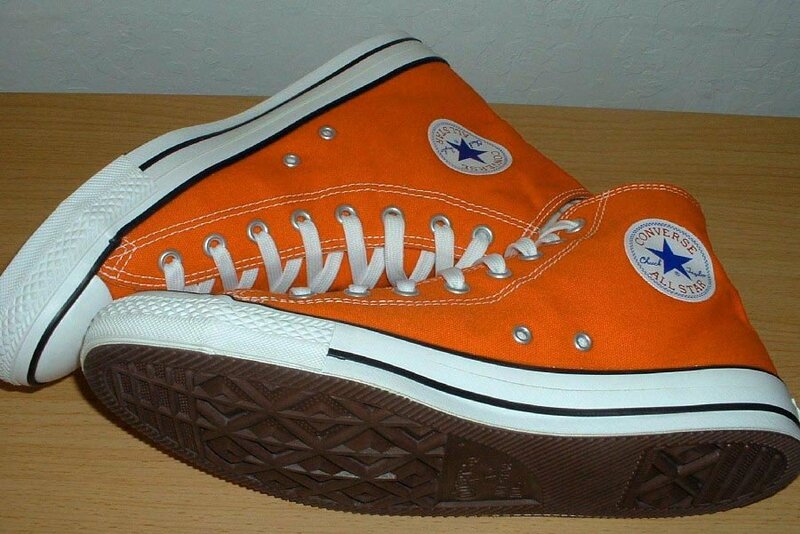 59 Orange Chucks Orange high tops, rear patch view. 60 Orange Chucks New orange high tops, front view. 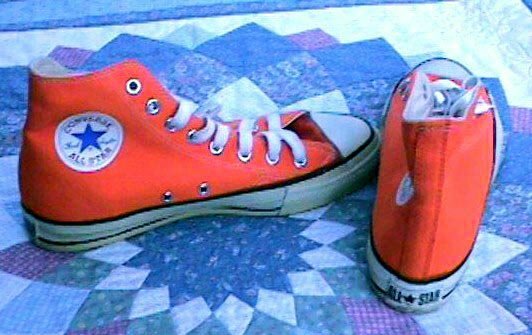 61 Orange Chucks Orange high tops, front view. 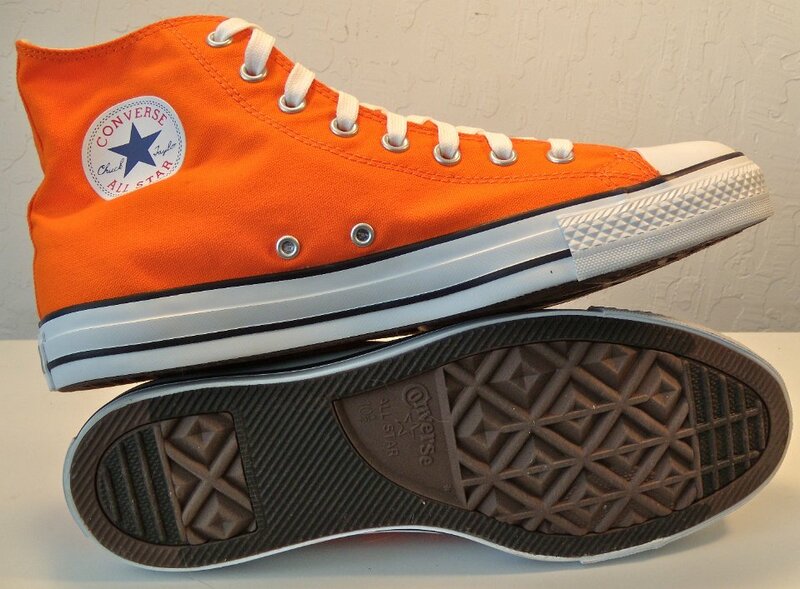 62 Orange Chucks Orange high tops, inside patch views. 63 Orange Chucks Orange high tops, outside view. 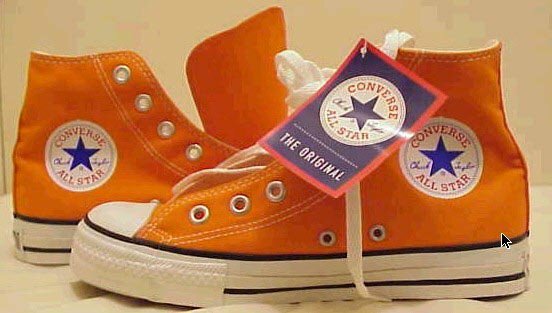 64 Orange Chucks Orange high tops, right inside and sole views. 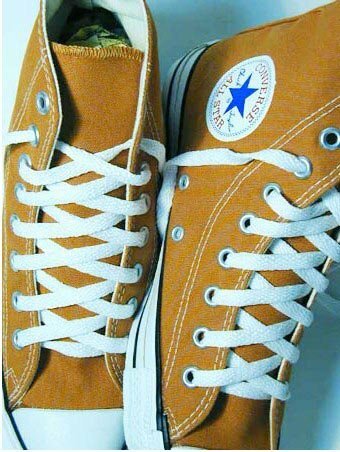 65 Orange Chucks Orange high tops, top view. 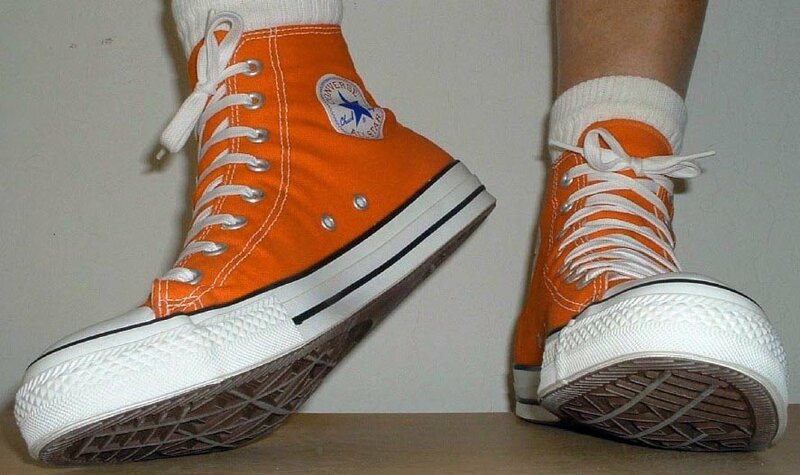 66 Orange Chucks Orange high tops, side patch views. 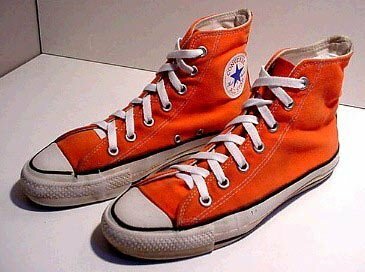 67 Orange Chucks Orange high tops, side views. 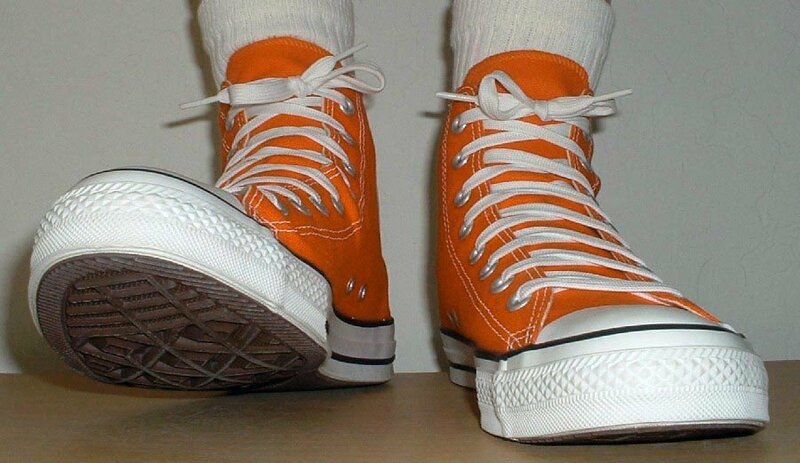 68 Orange Chucks Walking in orange high tops, front view. 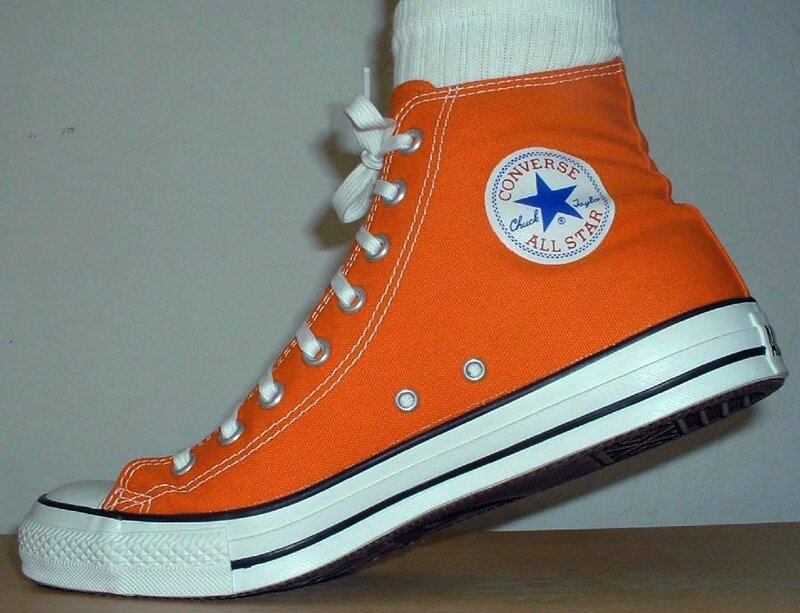 69 Orange Chucks Stepping out in an orange high top. 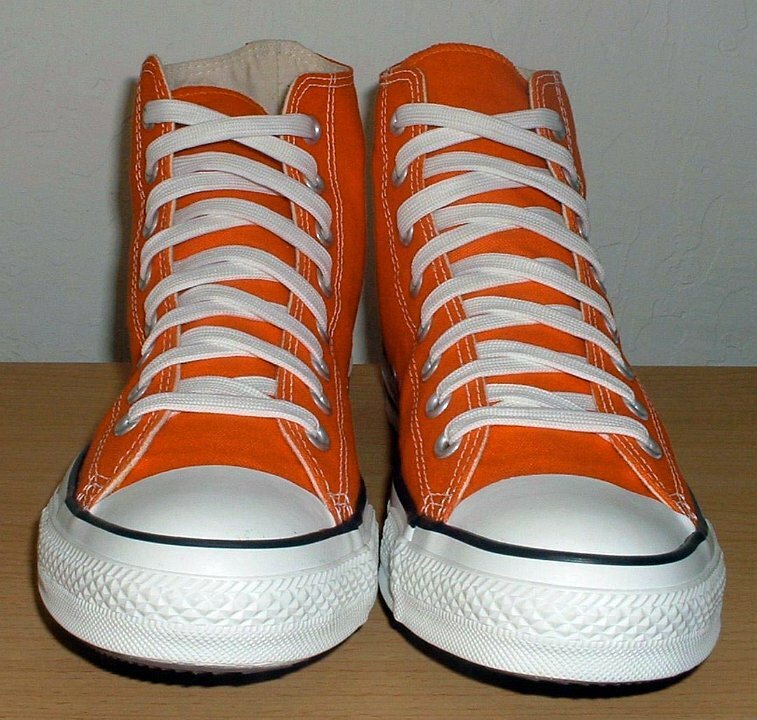 70 Orange Chucks Orange high tops on tip toes, rear view. 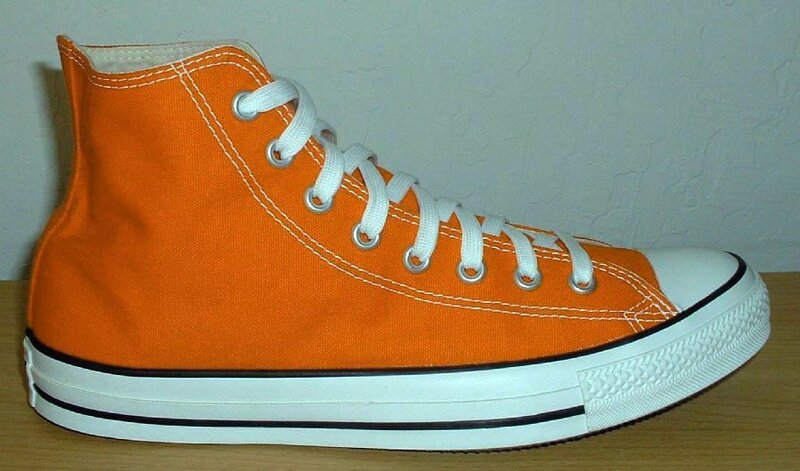 71 Orange Chucks Walking in orange high tops, side view. 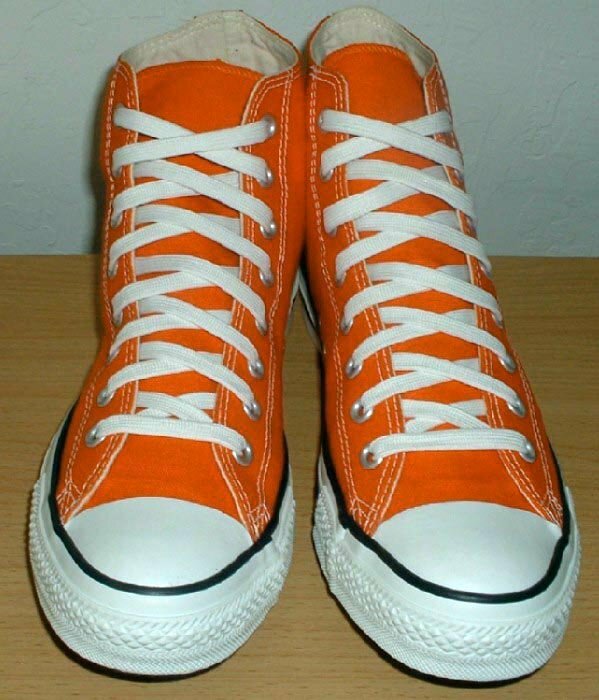 72 Orange Chucks Stepping out in orange high tops, front view. 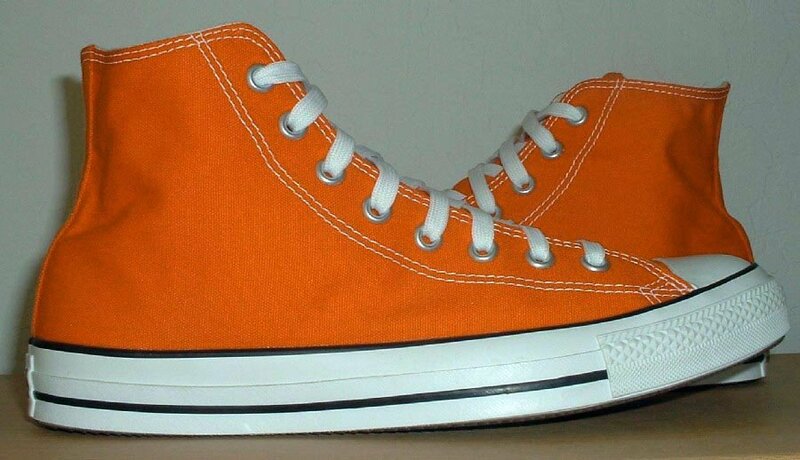 73 Orange Chucks Walking in orange high tops, front and sole view. 74 Orange Chucks Inside patch view of a right orange high top. 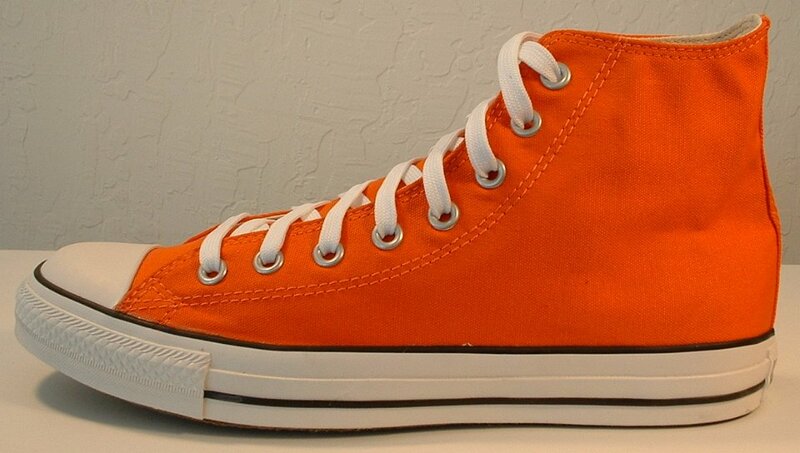 75 Orange Chucks Outside view of a right orange high top. 76 Orange Chucks Inside patch view of a left orange high top. 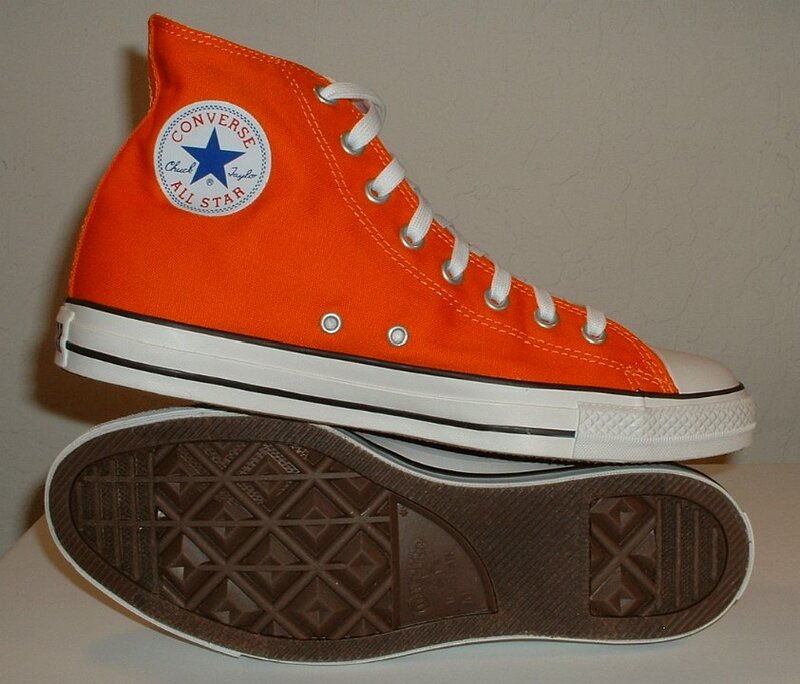 77 Orange Chucks Outside view of a left orange high top. 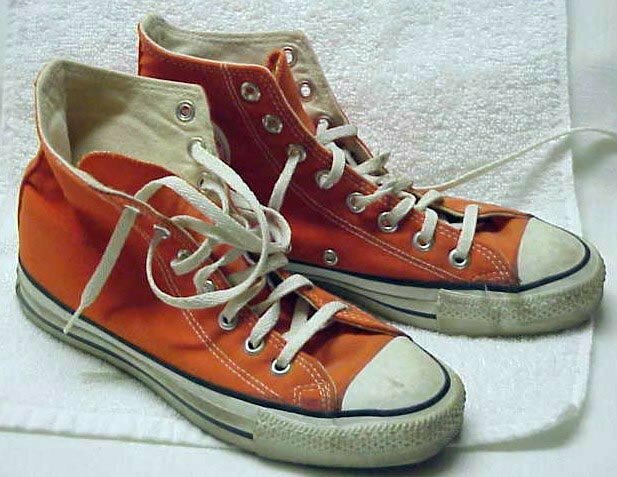 78 Orange Chucks Rear view of orange high tops. 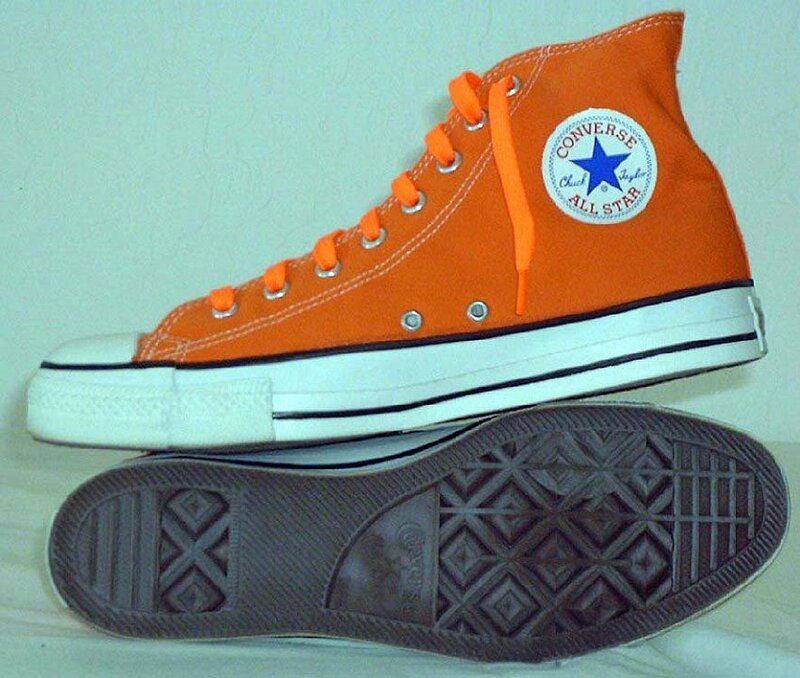 79 Orange Chucks Rear view of orange high tops. 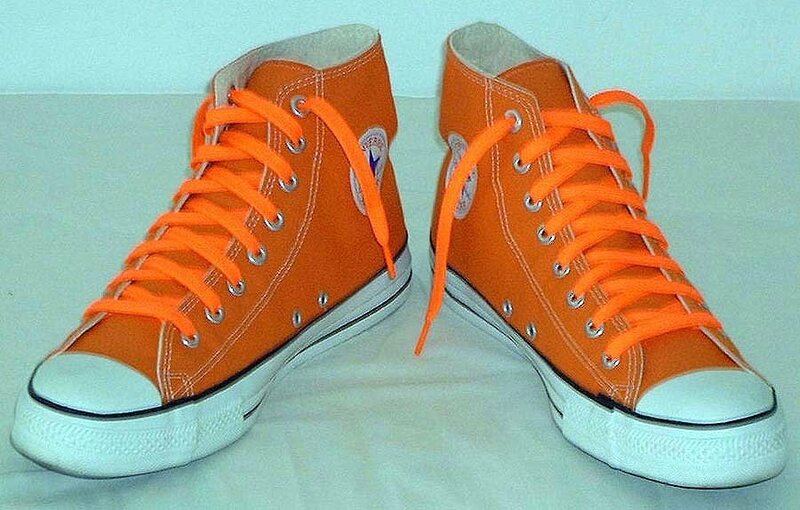 80 Orange Chucks Front view of orange high tops. 81 Orange Chucks Angled side view of orange high tops. 82 Orange Chucks Top view of orange high tops. 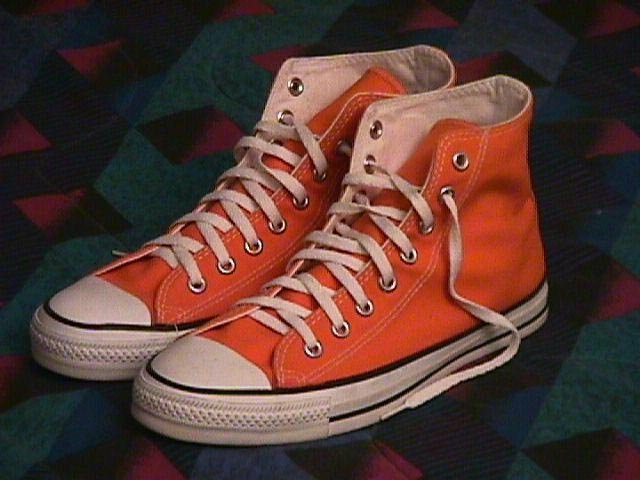 83 Orange Chucks Angled front view of orange high tops. 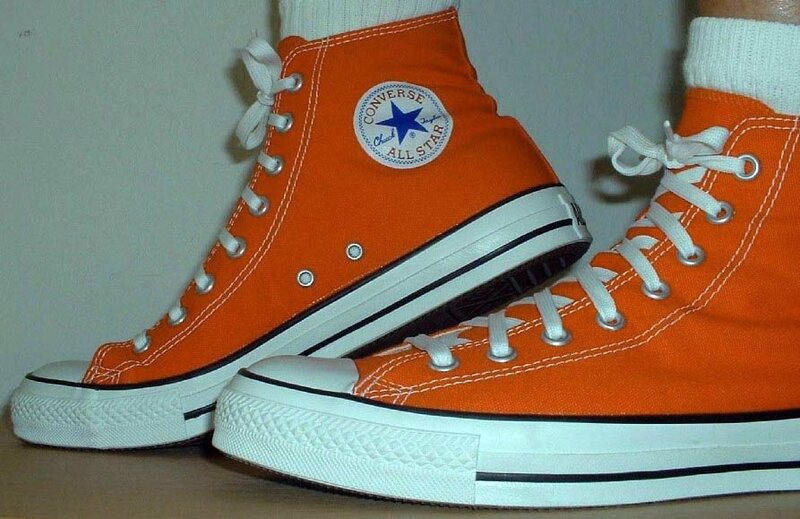 84 Orange Chucks inside patch views of orange high tops. 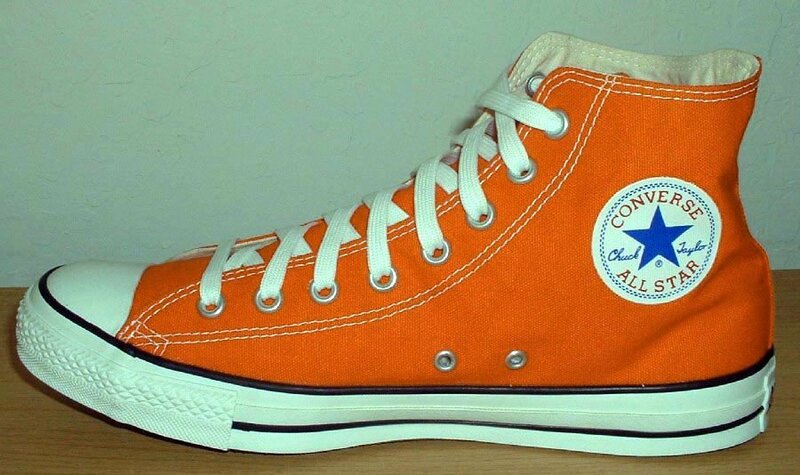 85 Orange Chucks Inside patch and sole views of orange high tops. 86 Orange Chucks Orange low cut catalog photo, angled side view. 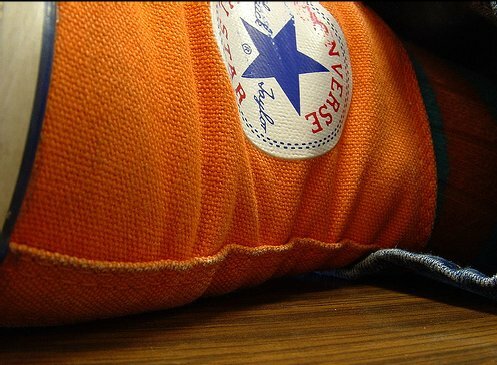 87 Orange Chucks Inside patch view of a left orange and royal blue high top rolled down to the seventh eyelet. 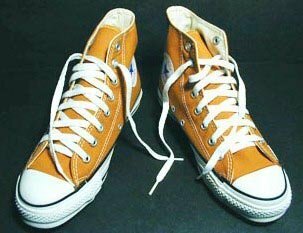 88 Orange Chucks Outside view of a left orange and royal blue high top rolled down to the seventh eyelet. 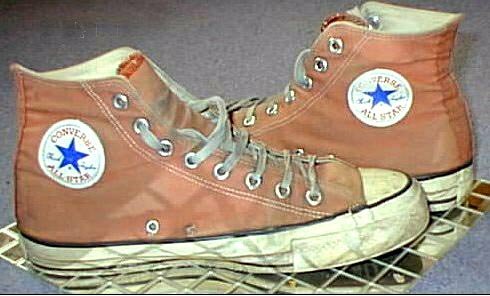 89 Orange Chucks Inside patch view of a right orange and royal blue high top rolled down to the seventh eyelet. 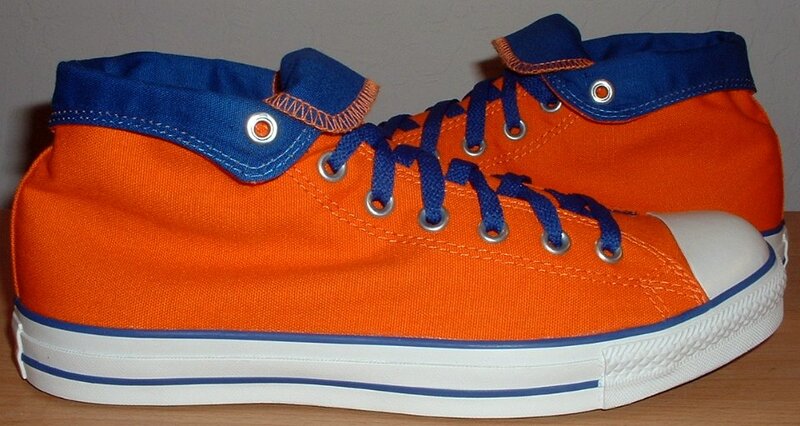 90 Orange Chucks Outside view of a right orange and royal blue high top rolled down to the seventh eyelet. 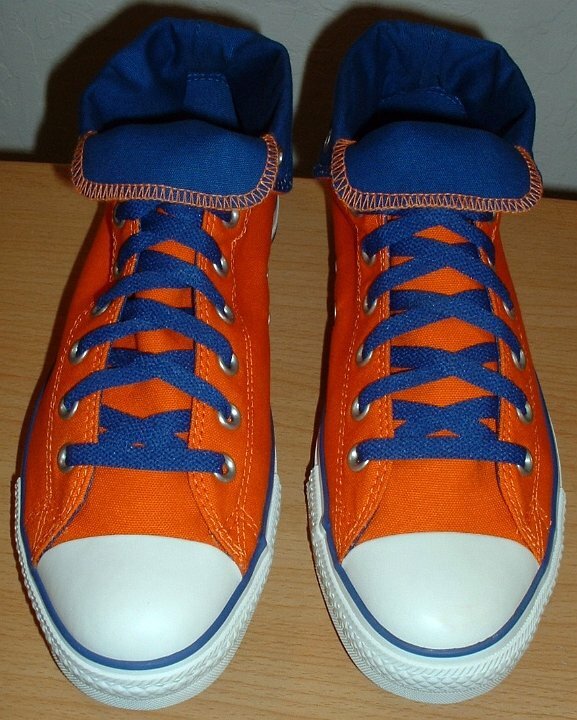 91 Orange Chucks Rear view of orange and royal blue high tops rolled down to the seventh eyelet. 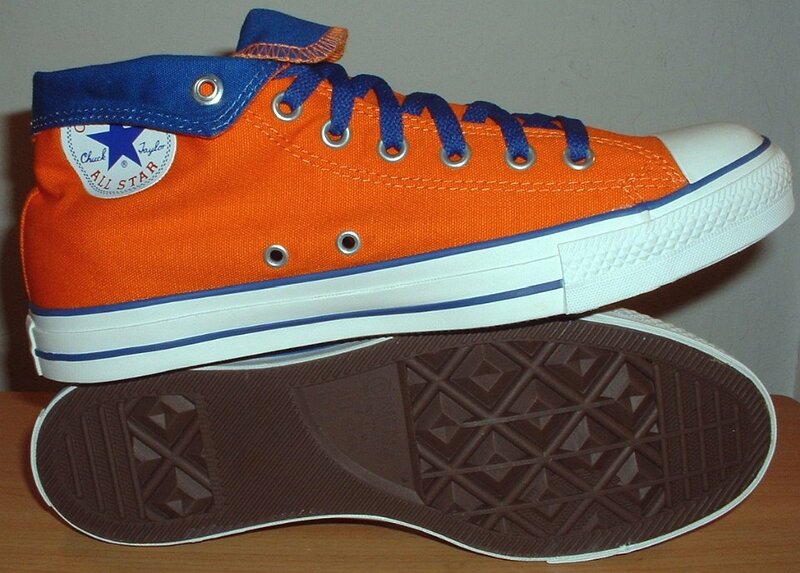 92 Orange Chucks Front view of orange and royal blue high tops rolled down to the seventh eyelet. 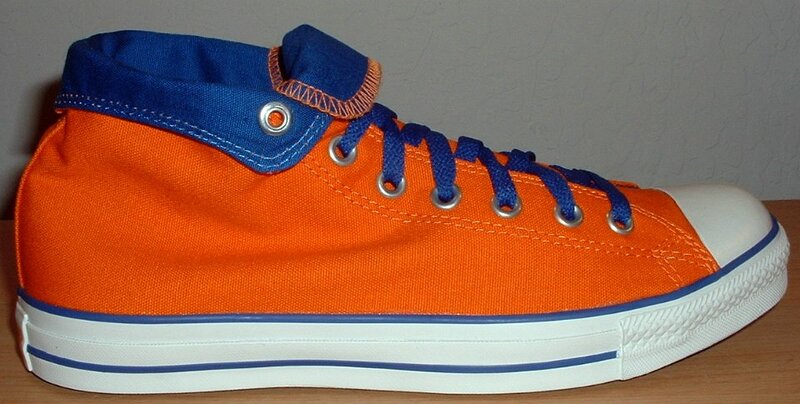 93 Orange Chucks Top view of orange and royal blue high tops rolled down to the seventh eyelet. 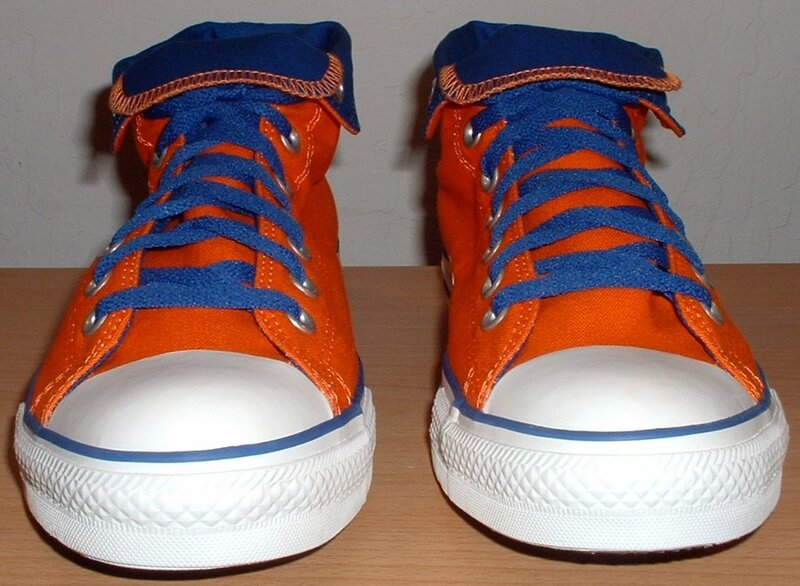 94 Orange Chucks Angled front and top view of orange and royal blue high tops rolled down to the seventh eyelet. 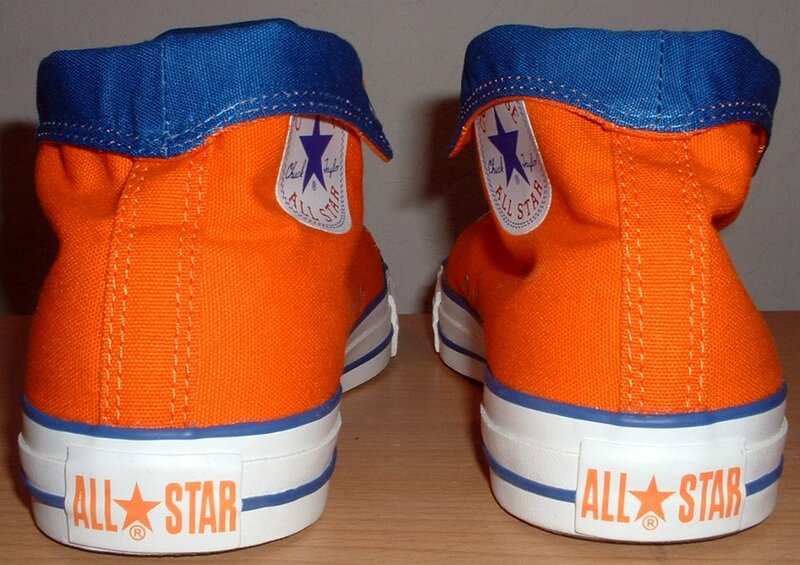 95 Orange Chucks Inside patch views of orange and royal blue high tops rolled down to the seventh eyelet. 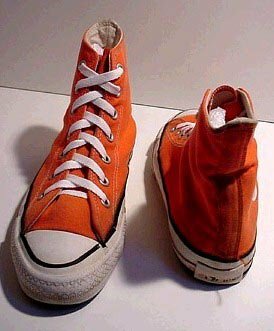 96 Orange Chucks Outside views of orange and royal blue high tops rolled down to the seventh eyelet. 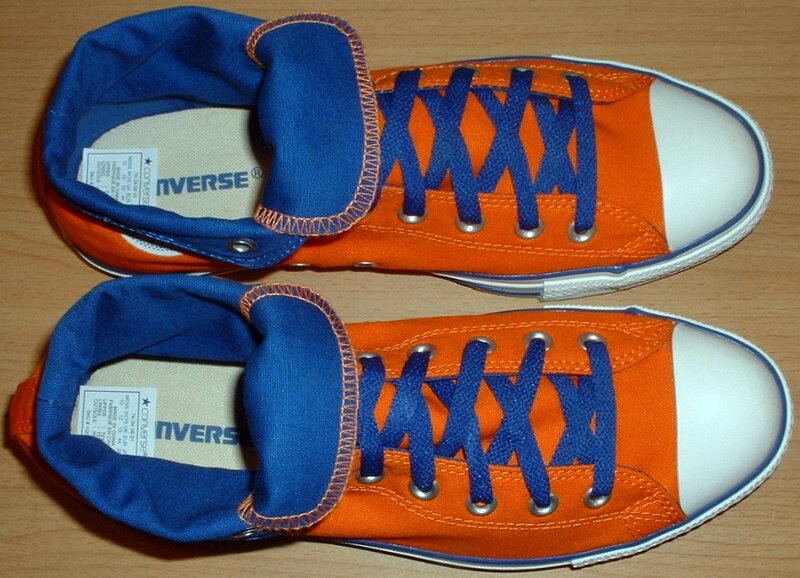 97 Orange Chucks Sole and inside patch views of orange and royal blue high tops rolled down to the seventh eyelet. 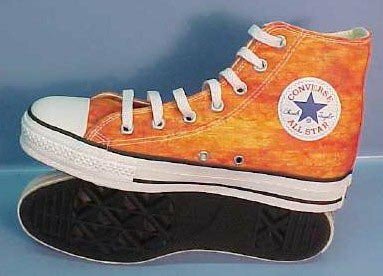 98 Orange Chucks Orange tie dye high tops, right inside and sole views. 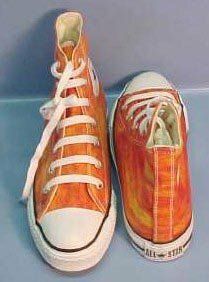 99 Orange Chucks Orange tie dye high tops, front and rear views. 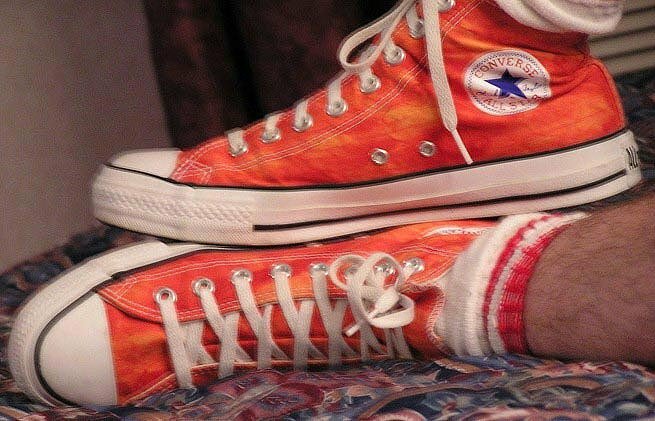 100 Orange Chucks Wearing orange tie dye high tops. 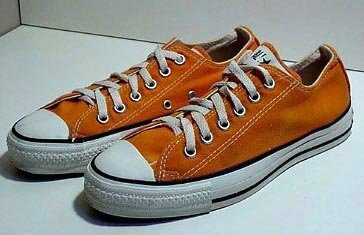 101 Orange Chucks Brand new orange tie dye low cuts. 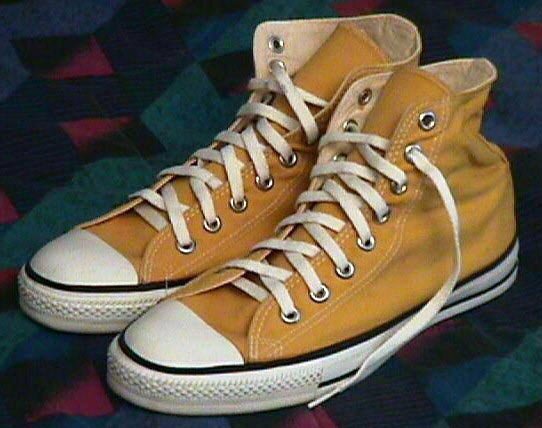 102 Orange Chucks Pumpkin high top, left inside view. 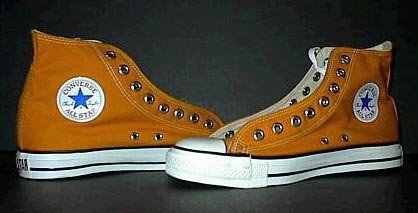 103 Orange Chucks Pumpkin high tops, top view. 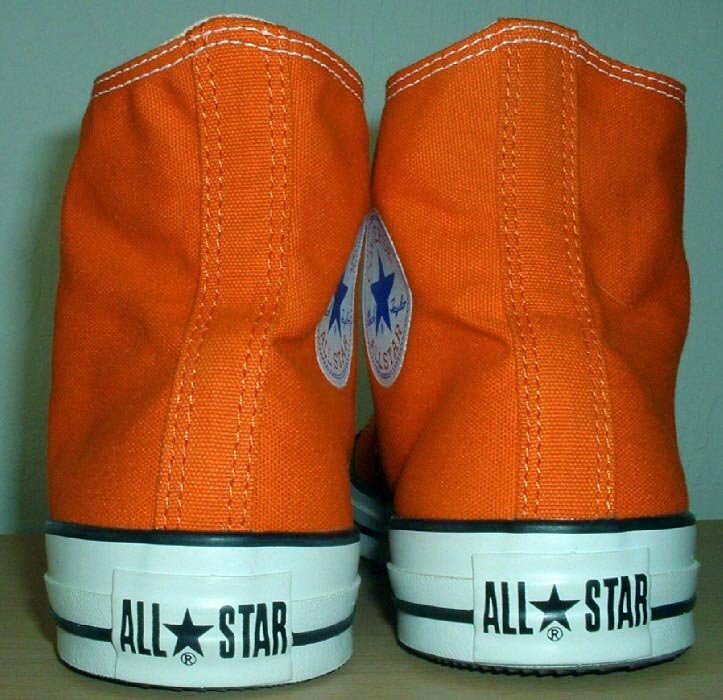 104 Orange Chucks Pumpkin high tops, with close up of inside patches. 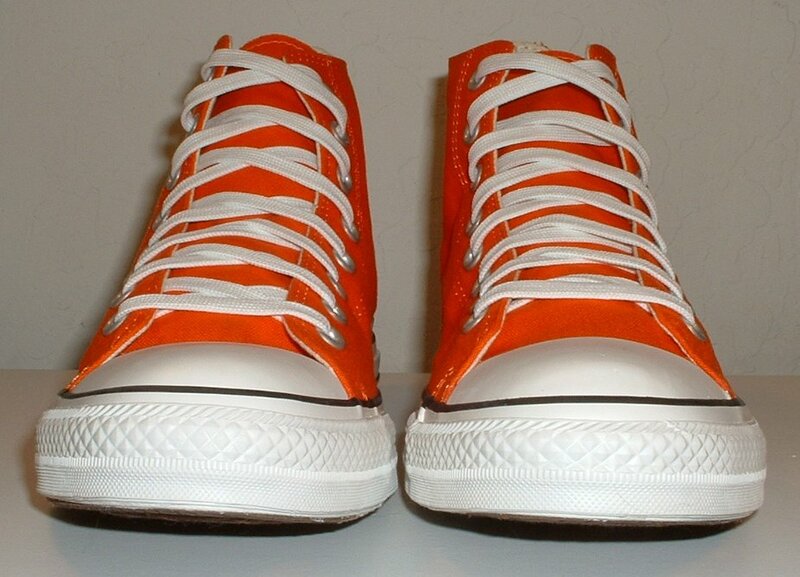 105 Orange Chucks Pumpkin high tops, angled side view. 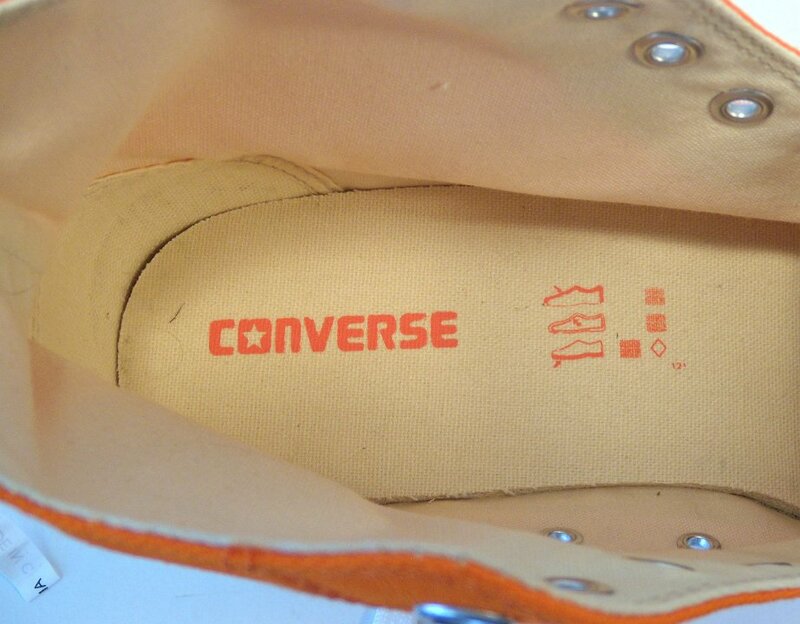 106 Orange Chucks Pumpkin orange high top, inside patch view. 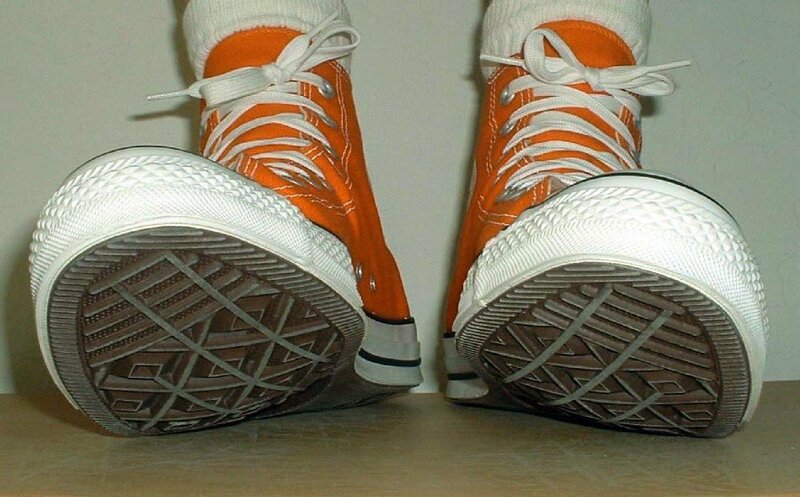 107 Orange Chucks Pumpkin high tops, top view. 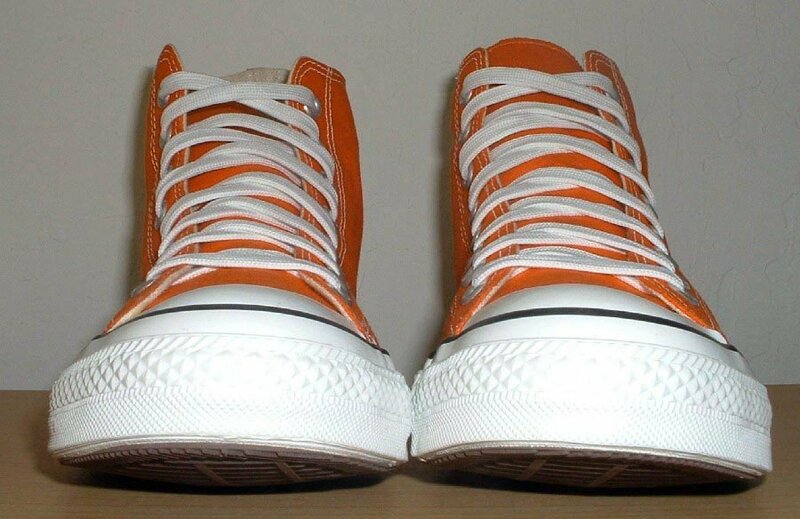 108 Orange Chucks Pumpkin high tops, angled side view. 109 Orange Chucks Pumpkin low cut, side view. 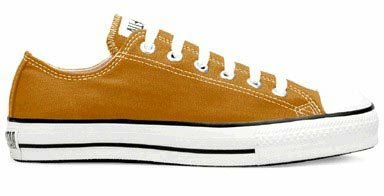 110 Orange Chucks Worn pumpkin low cuts. 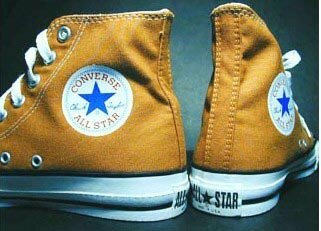 111 Orange Chucks Rust orange high tops, top view. 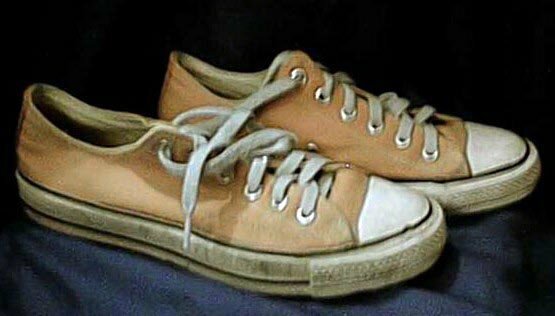 112 Orange Chucks Rust orange high tops, front and side views. 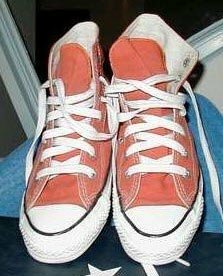 113 Orange Chucks Wearing vermillion high tops. 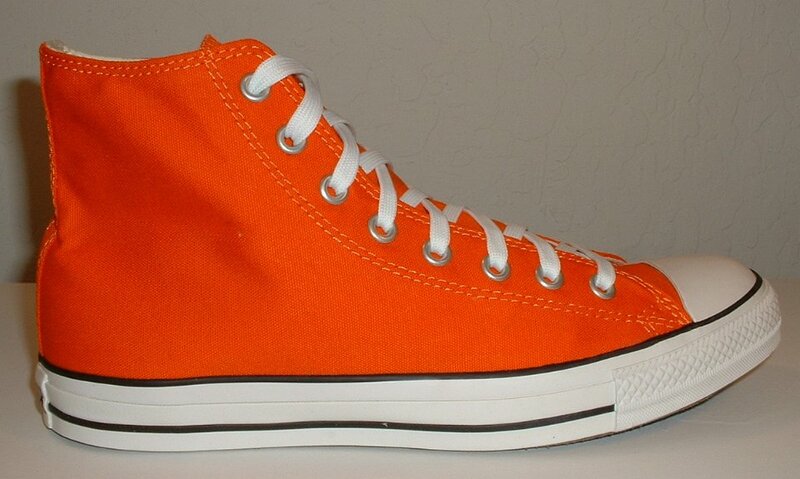 114 Orange Chucks Vermillion high tops, side view. 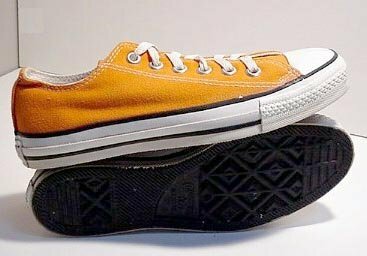 115 Orange Chucks Vermillion low cuts, made in USA, angled side view. 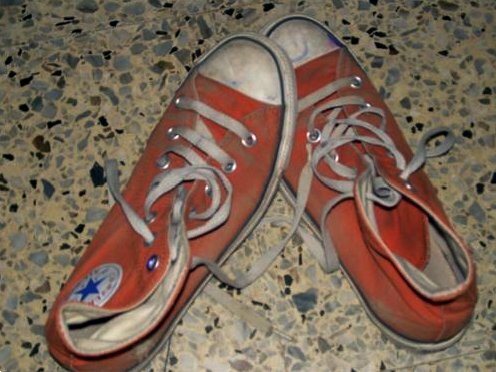 116 Orange Chucks Vermillion low cuts, made in USA, front and rear views. 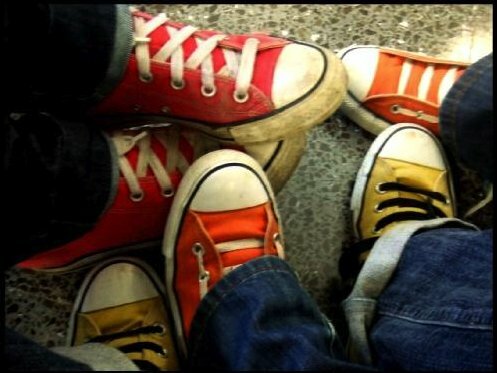 117 Orange Chucks Kids wearing orange chucks. 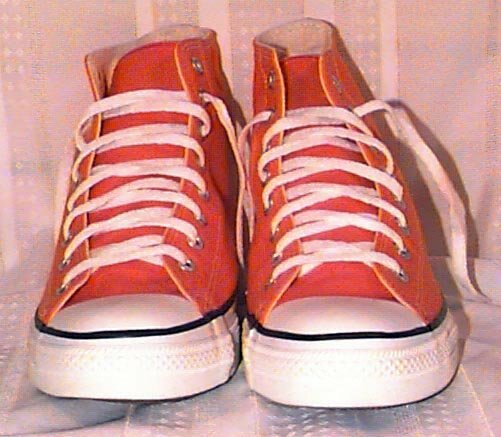 118 Orange Chucks Worn orange high tops, side views. 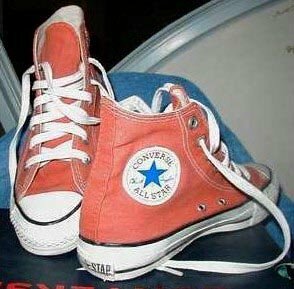 119 Orange Chucks Worn vermillion high tops, top view. 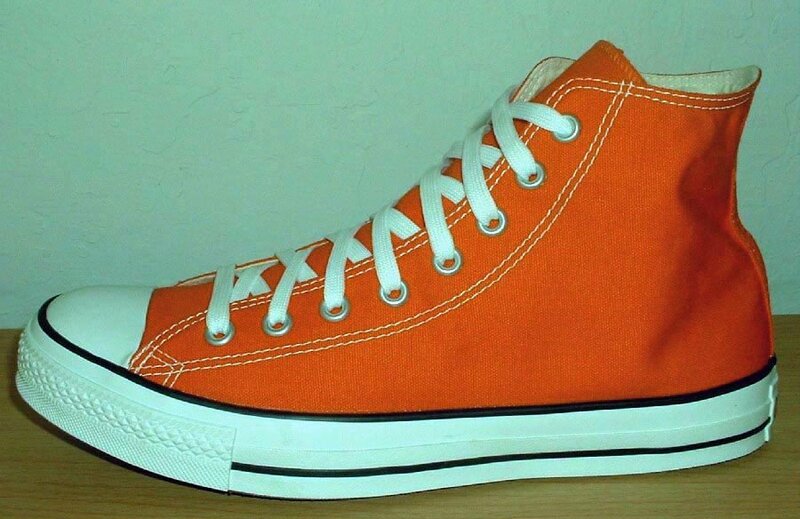 120 Orange Chucks Worn orange low cuts, angled side view.